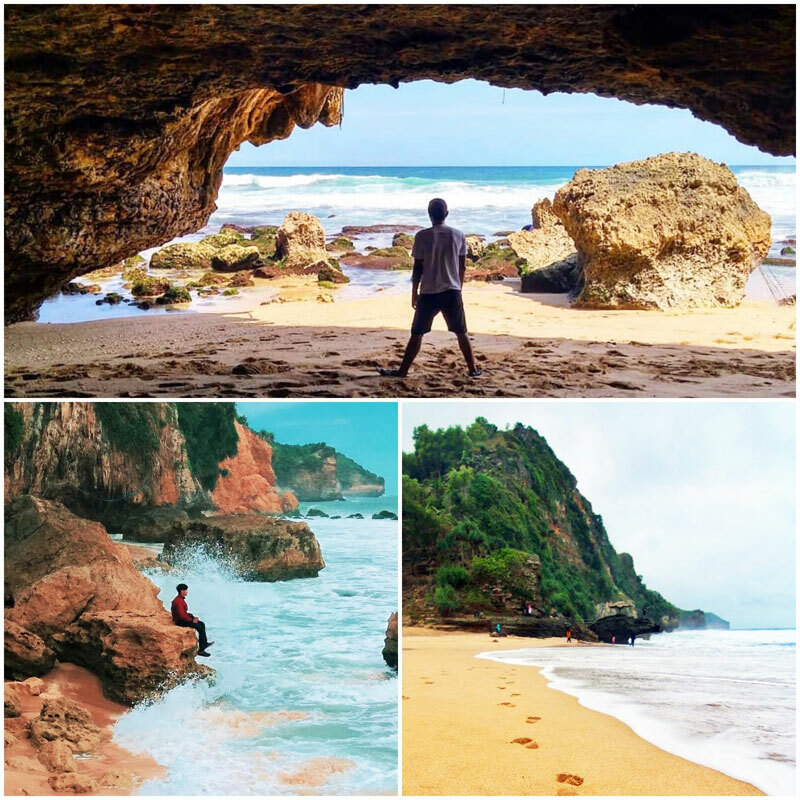 23 Hidden beaches in Yogyakarta (Gunung Kidul) with pristine shores, secret waterfalls and rugged landscapes! 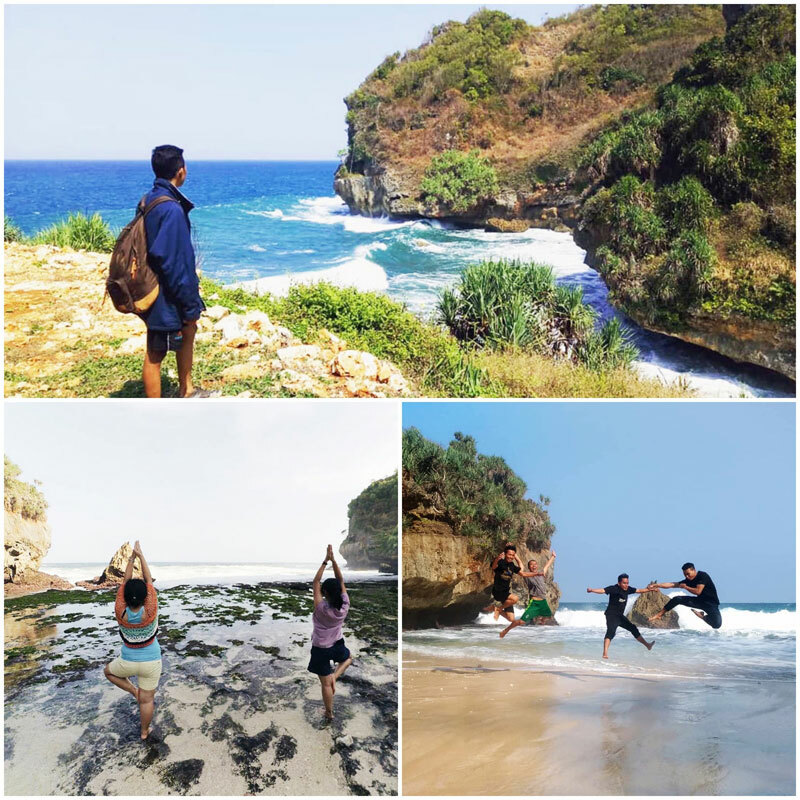 Indonesia > Yogyakarta > 23 Hidden beaches in Yogyakarta (Gunung Kidul) with pristine shores, secret waterfalls and rugged landscapes! 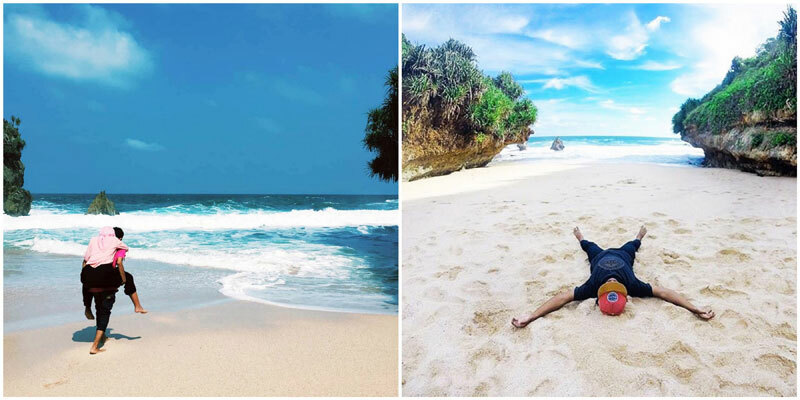 With the Indian Ocean lying adjacent to its southern shoreline, Yogyakarta (Jogja) is blessed with a collection of exotic and alluring beaches that are unknown to many and waiting to be discovered! 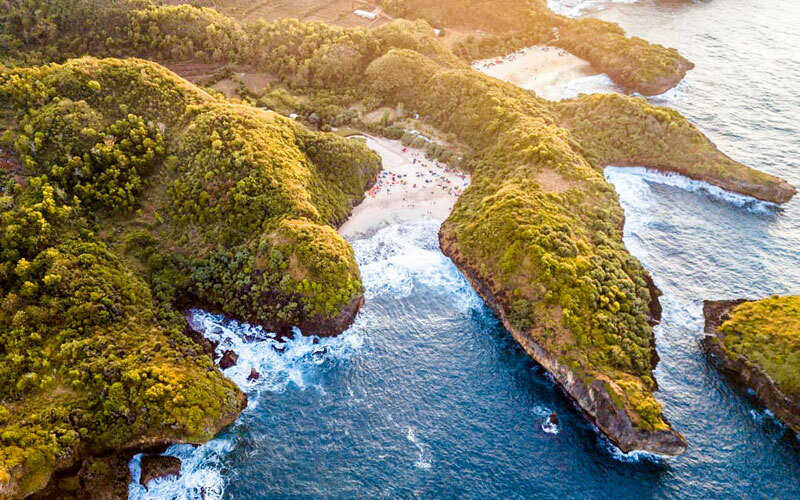 Here, you’ll find over 60 beaches that invite daredevils on an ultimate beach-hopping experience to discover the most surreal and majestic shoreline. 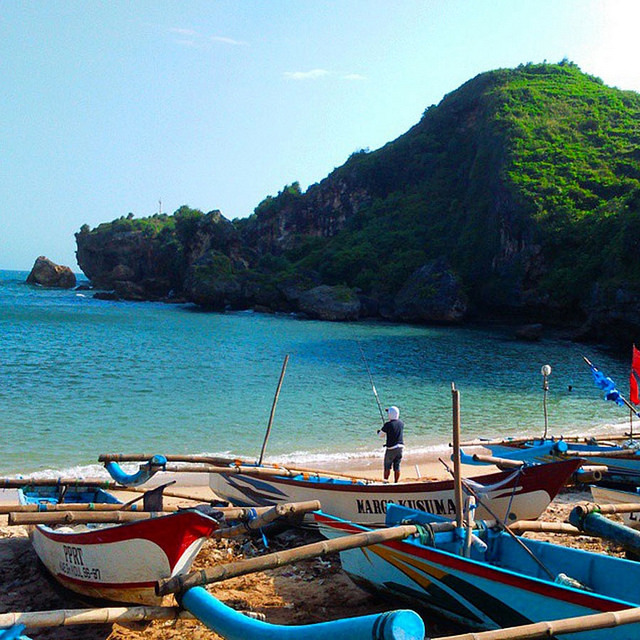 But if you think the beaches here are as mainstream as the ones in Bali, you couldn’t be more wrong. 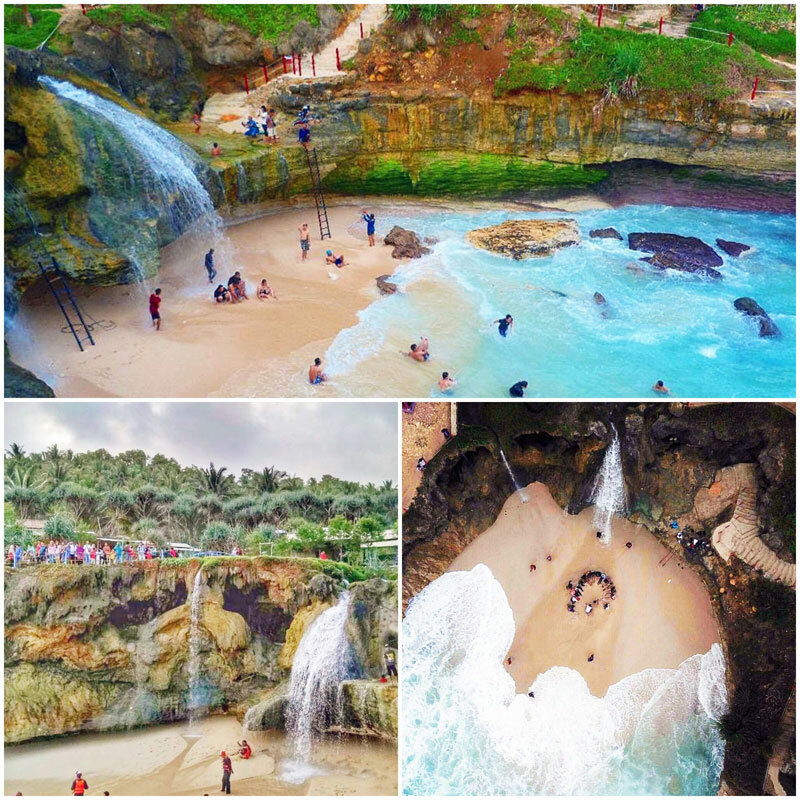 In Jogja, you don’t only get to enjoy azure waters, rugged landscapes and powdery sunburnt sand but other unique natural wonders like one with its very own sunflower field or better yet a beach waterfall! But the one that steals the show is one for the adventurous – will you dare cross over the bridge or hop on the gondola to combat the waves?! Eager to know more? 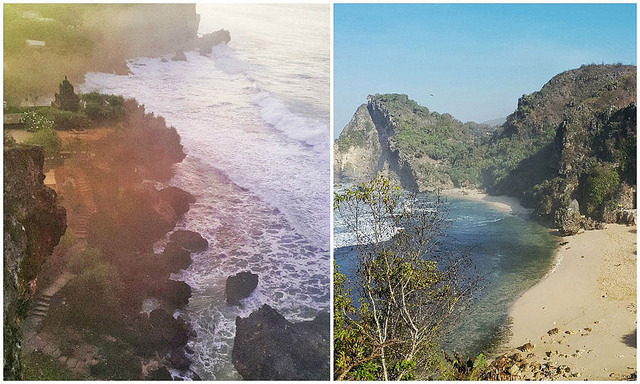 Let’s take you on a trail along the best secret beaches in Yogyakarta! 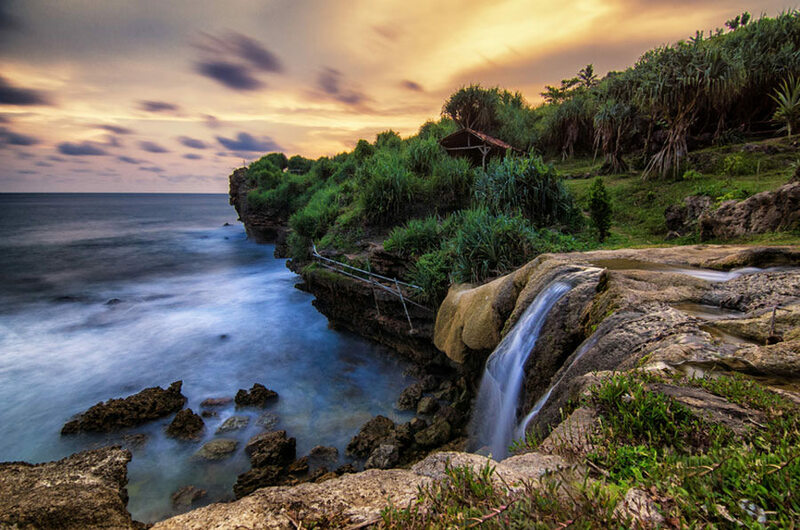 This cliffside beach offers endless sea views that will surely remind you of Bali’s iconic Uluwatu. 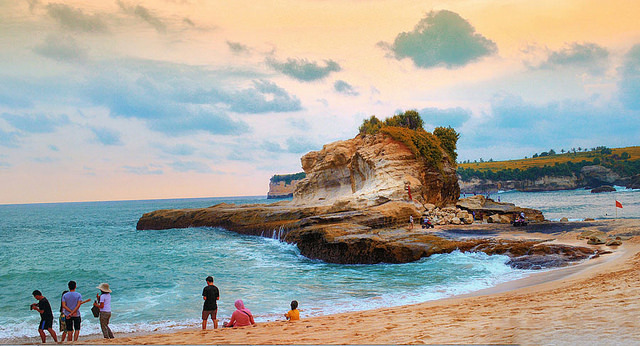 However, don’t expect it to be just another typical cliffside beach as here you’re guaranteed a special and unique feature that is difficult to find elsewhere across Indonesia. No stress, the spot is safe, strong and sturdy even after being invaded by hundreds of Instagrammers looking for the best shot to impress their virtual friends. 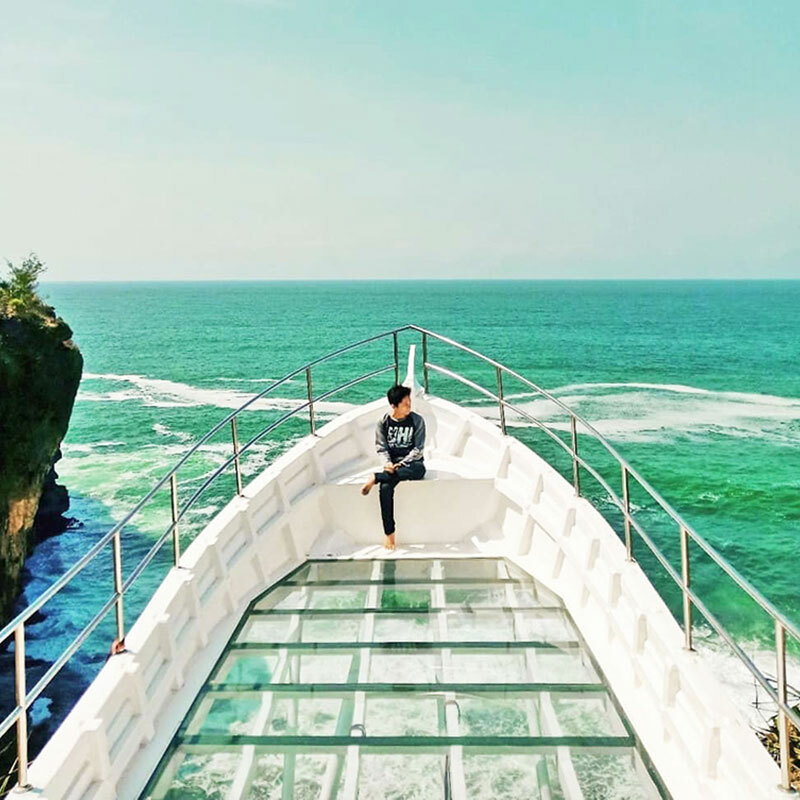 Now if Cinderella took over the world, thanks to her glass shoes, you sure could be famous for stepping on a glass terrace overlooking the rugged sea of Jogja! Once there, you can also find other quirky photo spots such as a giant chair on the edge of the cliff (would you dare sit here?!) 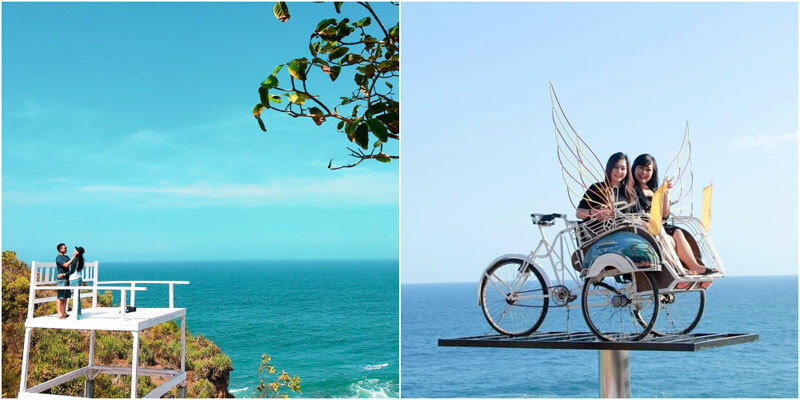 and cycle rickshaw with wings! These are just begging to be photographed!! Always wanted to take a relaxing dip in the ocean but end up getting washed to and fro by the constant waves? 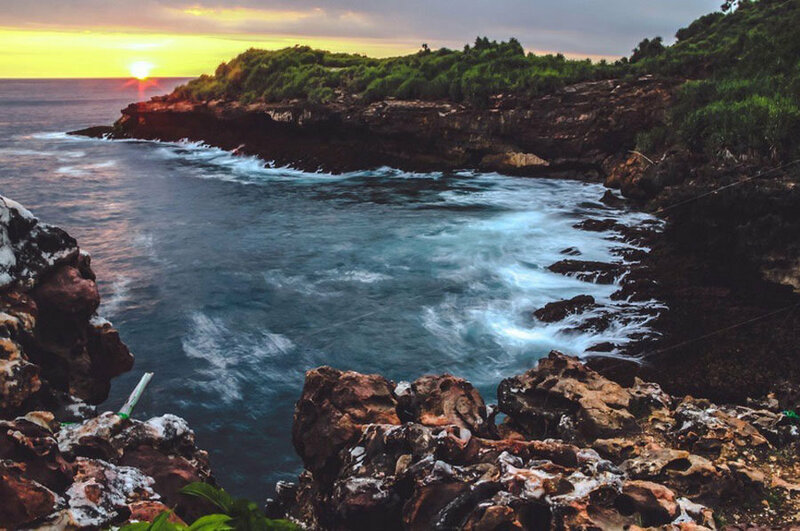 At the Wedi Ombo Beach in Gunungkidul, you can soak peacefully in the salt water as you watch the sun sink into the horizon. 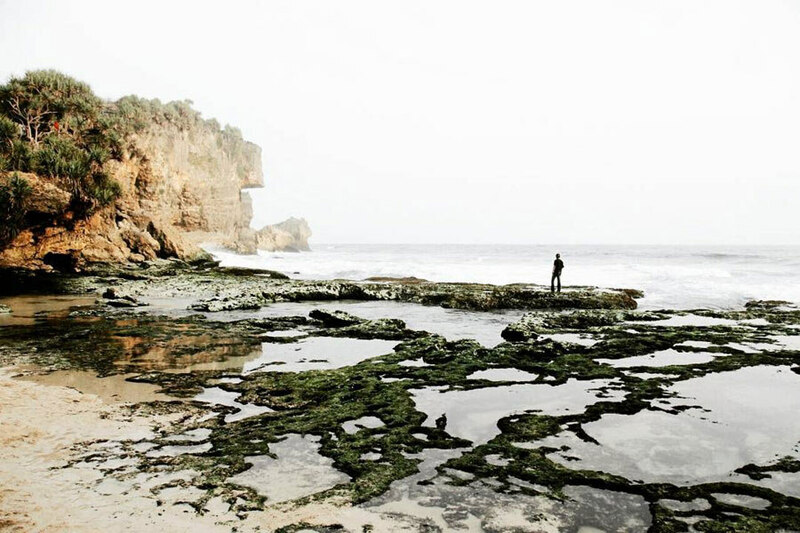 Surrounded by neatly stacked coral rocks, you might even start to think that the lagoon at Wedi Ombo Beach is man-made. Be wary of the tide levels here though. High tides have been seen to overflow into the lagoon, bringing its violent waves along. In a worst case scenario, the sudden gush of water creates a current strong enough to pull people towards the sea, possibly hitting coral rocks and causing injuries. Getting There: From Siung Beach, head towards the Tepus Junction and turn right, stay on the road and your destination will be on the right side of the road. Coordinates here. This little nook of paradise feels like it’s worlds away from the hustle and bustle of the city. But oh, you don’t want to miss the waterfall by the beach while you’re there! 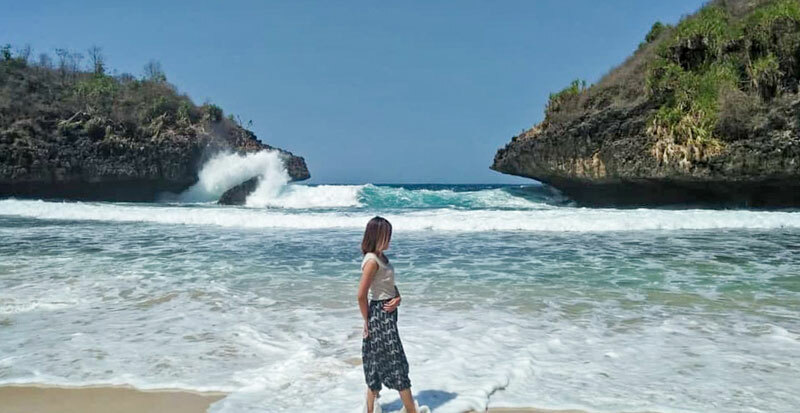 At Banyu Tibo Beach, visitors are left speechless by the beauty and miracle of Mother Nature as they get to relish the soothing water cascading from the cliff, down to the sand stretch and further flowing right into the sea. The small waterfall winds its way to the ocean through a rock crevasse. The waters are beautifully turquoise so don’t miss the picture-perfect views from the top of the cliff! 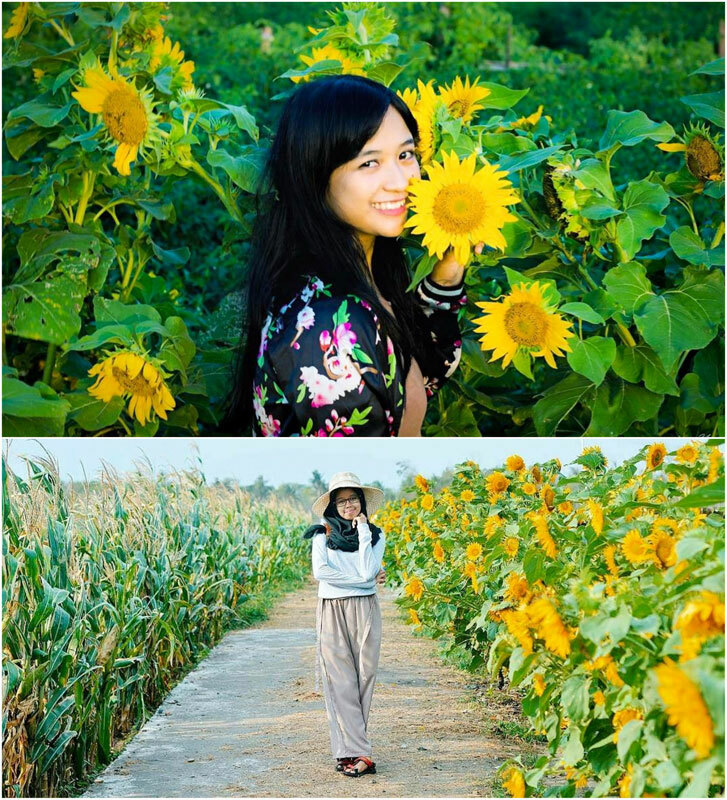 This sunflower garden is a novel selfie spot that has become an instant sensation on Instagram. 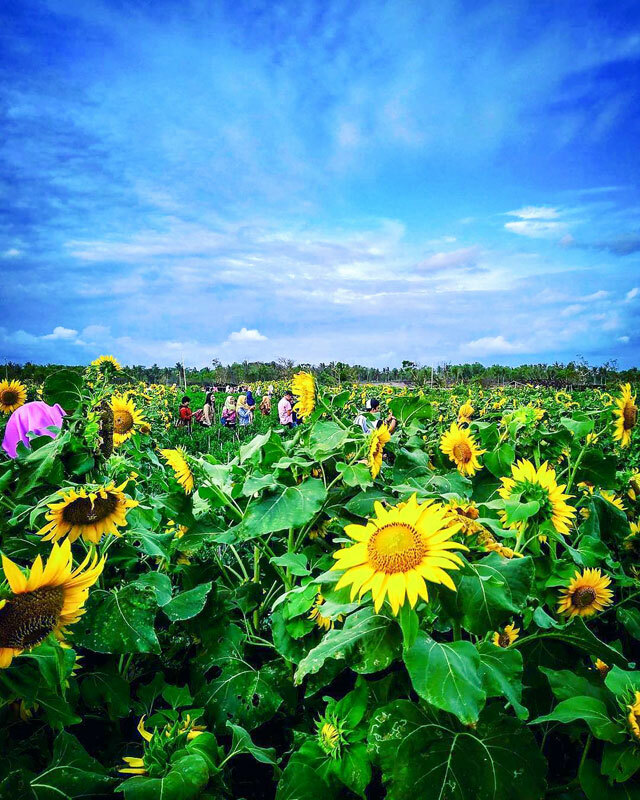 Though not particularly big and located just 5 minutes away from Pantai Samas (a humdrum beach that most people neglect), this sunflower garden that blooms all year long has successfully attracted nearly 2000 people a day during the peak season. Curious about why this place is such a hit? Come visit and find out for yourself! 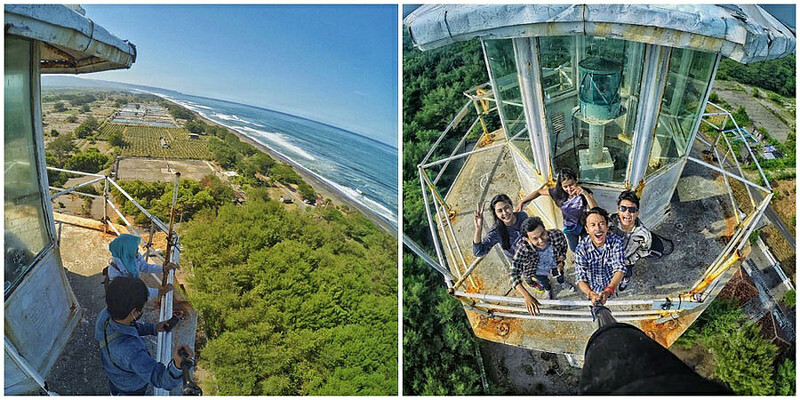 Sitting high and mighty at over 30 metres in height, the Pandansari Beach in Bantul is home to the one-and-only lighthouse in the region of Yogyakarta. 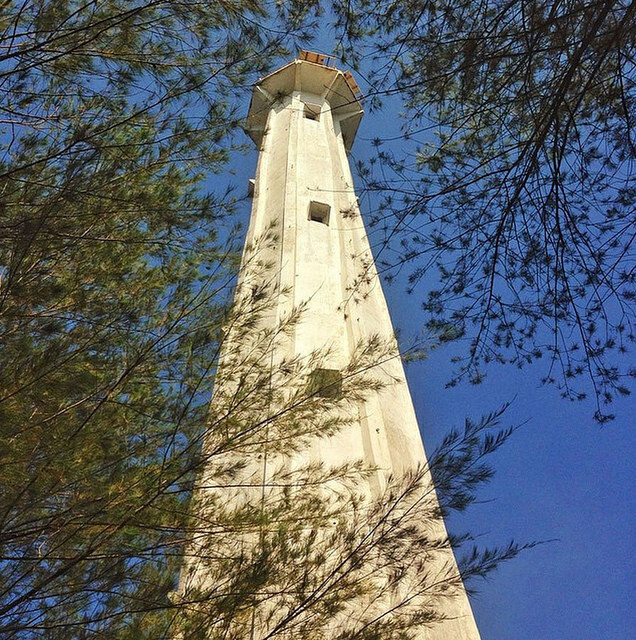 Still in operation, visitors are allowed to climb up its winding staircase during the day, to enjoy a bird’s eye view of the beach at seven storeys high. This place is also known for its dragonfruit plantations. You won’t miss the patches of bright red looking down from the top of the lighthouse. 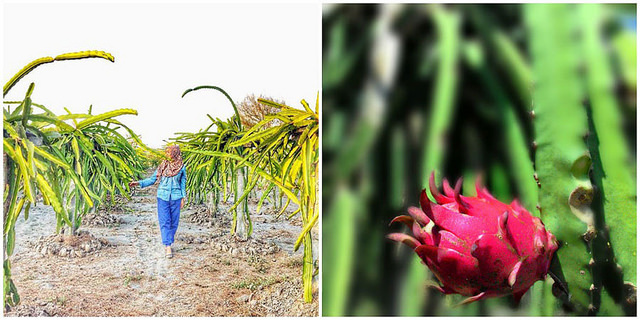 Visitors can actually roam around the gardens and pick ripe dragonfruit straight from the trees – it makes for a highly nutritional gift from Pandansari Beach! And don’t overlook the greyish sands. Spruce trees are found to grow right onto the fringes of the beach, and during the dry seasons between April and September, they shed most of their leaves, leaving behind a stunning sight that reminds you of autumn in Japan. Getting There: From Yogyakarta, head towards the city of Bantul. From there, head south towards Pantai Samas. Once there, turn right and drive along the coast. Coordinates here. 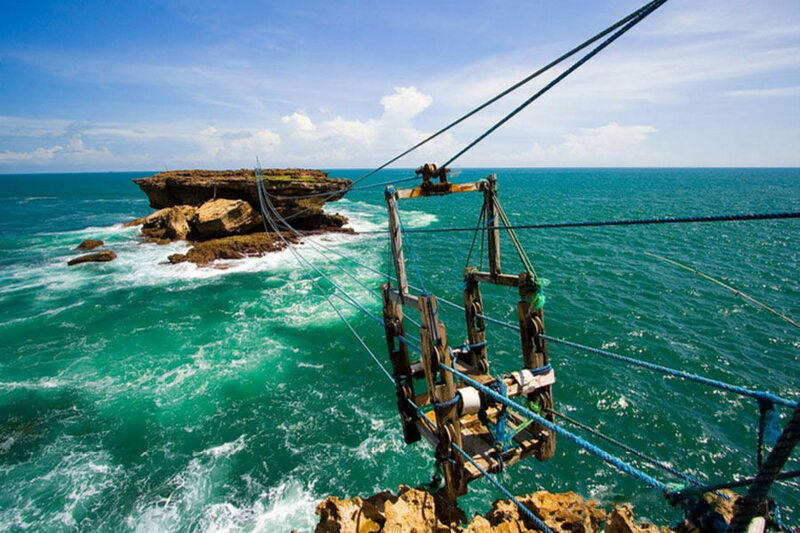 Visitors can test their courage by crossing onto Watu Panjang Island on a wooden ‘cable cart’ tied together on pulleys that are not made with the usual steel cables, but with fabric rope! Before you reach, you might come across several road signs pointing you to Timang Beach along the way, but do avoid following them as they lead you to scammers trying to convince you to take the jeep to the beach (they will tell you that the road conditions are too bad for cars), though it is physically possible for cars to drive in. Use this unmarked road entrance instead, and you will be able to drive down a proper road all the way to the beach. Following the road signs will lead you to a rocky road that your car would be unable to drive through. Getting There: From Wonosari, head South on Jl. Baron – turn left onto Jl. Tepus – turn left onto Jl. 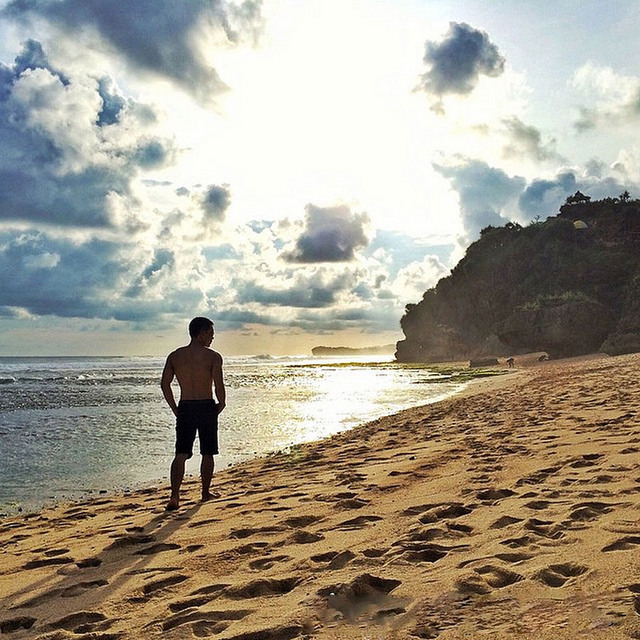 Pantai Selatan Jawa. Coordinates here. 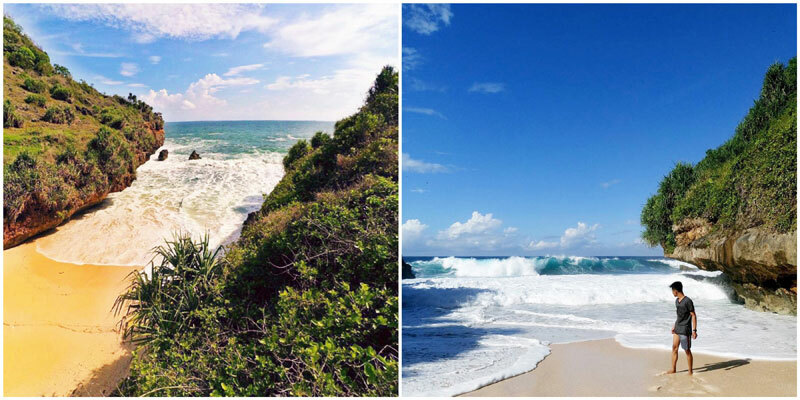 Looking for a secluded beach to escape to with your loved ones? Take a short trek through rugged landscapes and you’ll find Greweng Beach resting with its calm and clear waters – the perfect spot for some intimate moments! As this virgin bay is encircled by sturdy green rock formations, the currents here come in a comfortable strength and pleasant pace, making beach swims safe and ideal for families. 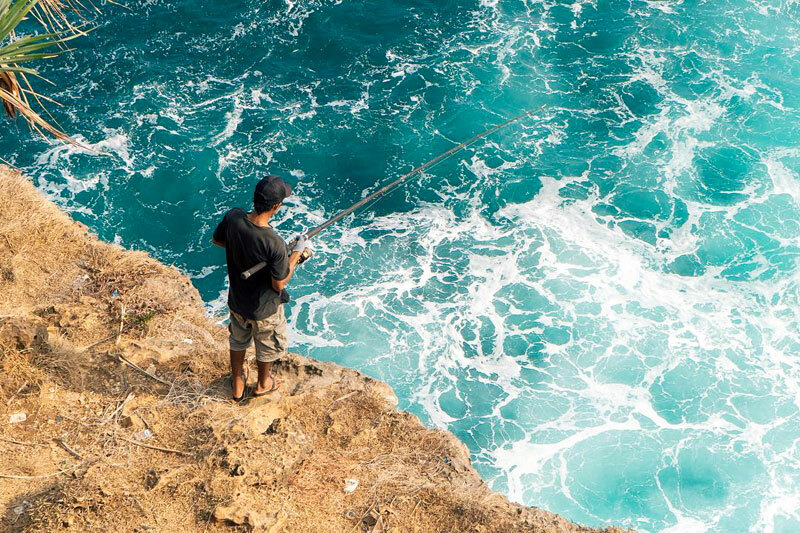 For fishing enthusiasts, why not come and put your reeling skill in action? The mangroves nearby attract plenty of amazing sea creatures. 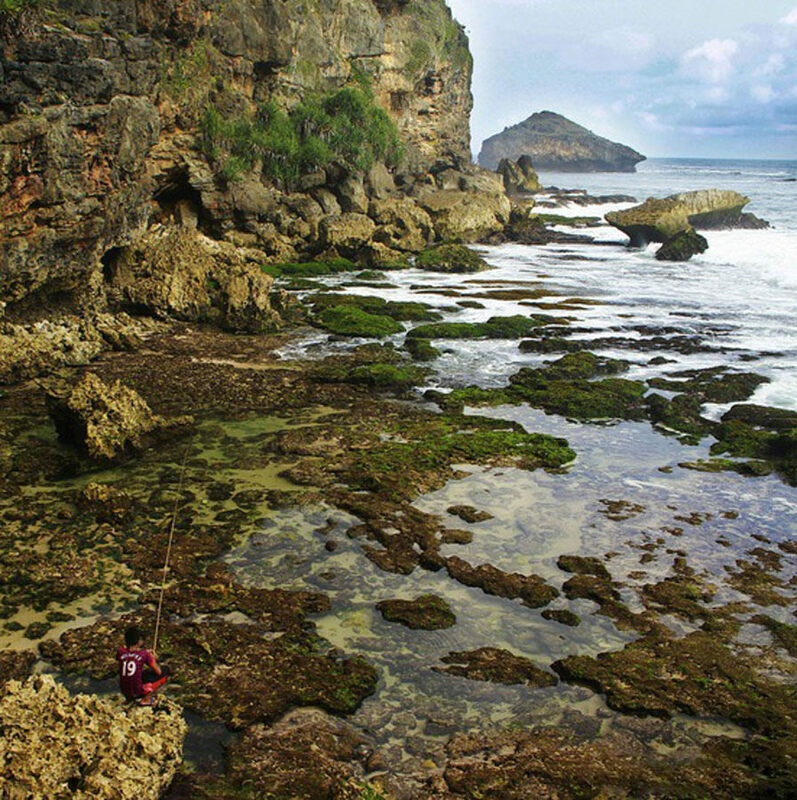 Rumour has it that a nearby cave has been used by Nyi Roro Kidul (ruler of the Southern Sea) as a meditation spot. Can you find it?! 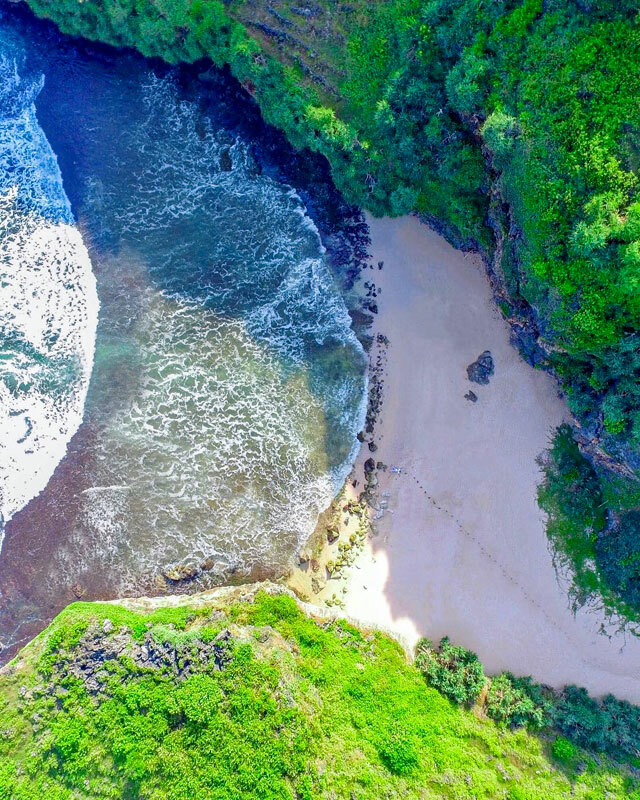 Pristine, wild, and stunning are just some of words that best describe this hidden gem of a beach. This is the ultimate spot for campers and nature lovers looking for a short escape from a week of stressful city life. Surrounded by evergreen hills and adorned by clear waters and sparkling sand, Ngrumput beach promises solitude amidst nature. Drop by if you want to unwind and simply enjoy fascinating scenery. With such breathtaking views and relaxing vibes, it’s no surprise that many local campers opt to spend a night here to hunt for the glorious sunset and magical milky way. Nature lovers can also find a marvellous sight of wild waves piercing though dazzling reefs here. And If you enjoy hiking, try and conquer the nearby Kosakora hill. Upon reaching the peak, you will be rewarded with endless views of the gorgeous horizon, resting in perfect harmony with the surrounding lush hills. Parking fee: Rp. 3,000 for motorcycle (Approximately USD $0.21); Rp. 5,000 for car (Approximately USD $0.35). 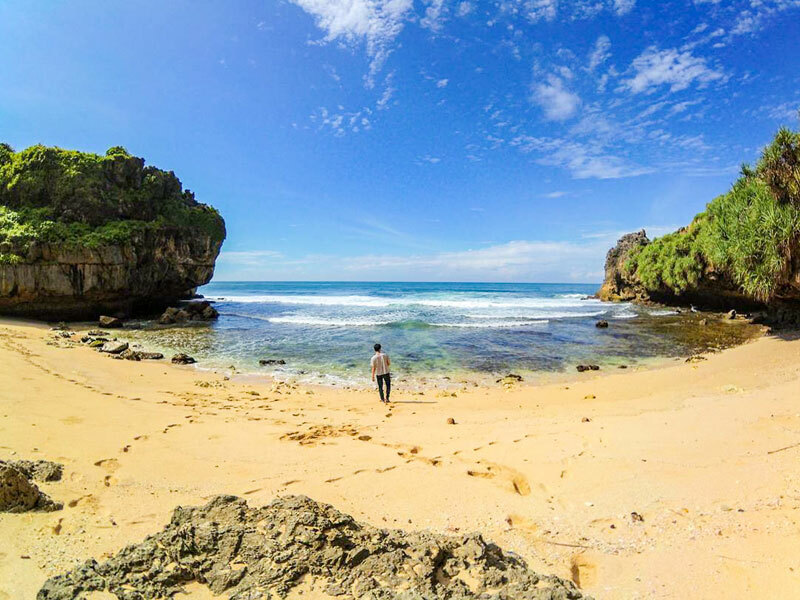 Hidden behind a towering and majestic cliff in Tepus Village is an untouched beach that boasts an impressive horizon that is sure to indulge your every senses; and that’s the beauty of Watu Nene Beach! 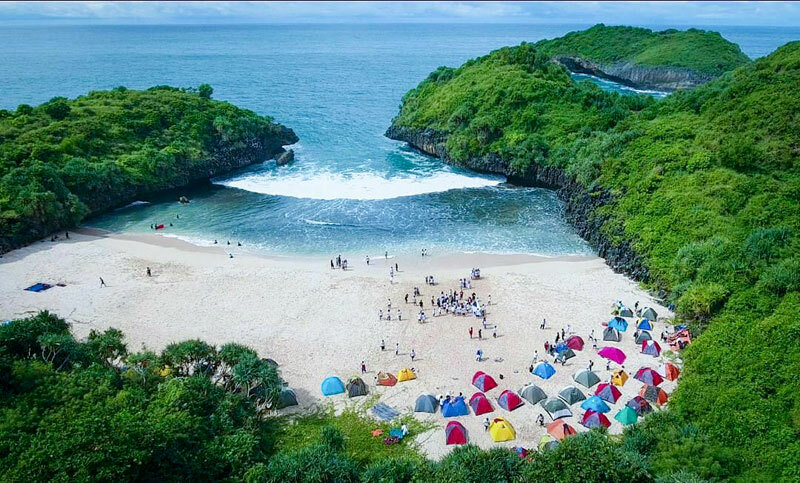 Sandwiched between a collection of magnificent cliffs and the grand Indian Ocean, this beach might remind you of Bali’s famous Dreamland Beach, but rest assured, you won’t find similar crowds of tourists here; come and stay for the tranquil and serene atmosphere. However, do note that reaching this beach is no easy task! You must first drive through a narrow pathway down the cliff and many report it to be challenging and rather dangerous. We recommend you to be careful or simply opt for an experienced driver to take you there! Flanked by two dramatic cliffs, this 100-metre-long virgin beach is where you can find calm waters with glistering blue colours, perfect for a refreshing swim or a rewarding snorkelling session amidst spectacular marine creatures. 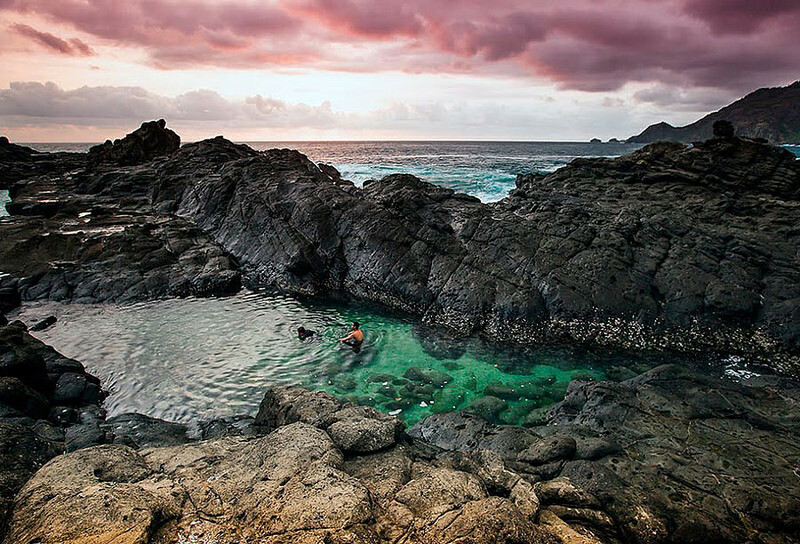 We recommend you to drop by during the late afternoon to enjoy low tides and calming waters for a simple soak. 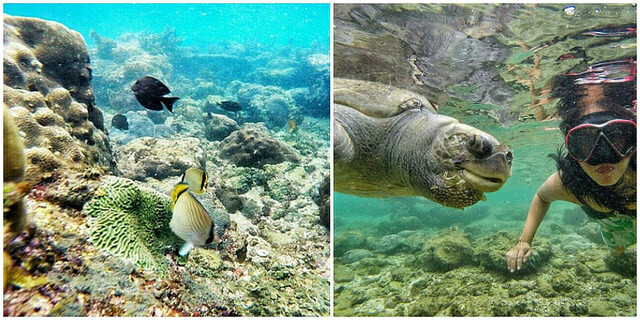 During the high tides, you can take a deeper dip and witness schools of fishes making their way through the corals. Other sea creatures that call this beach home include the adorable sea turtles! From April to August every year, they will migrate here and lay their precious eggs. Besides beach lovers and turtles, this beach also attracts numerous local fishermen on the lookout for a good catch! Of course, doing nothing and just lazing around the beach is an activity to consider too – the soothing sounds of the waves slipping through the cliff rocks alone will rejuvenate your body, mind and soul. To be frank, it’s not easy to find this shy little paradise. 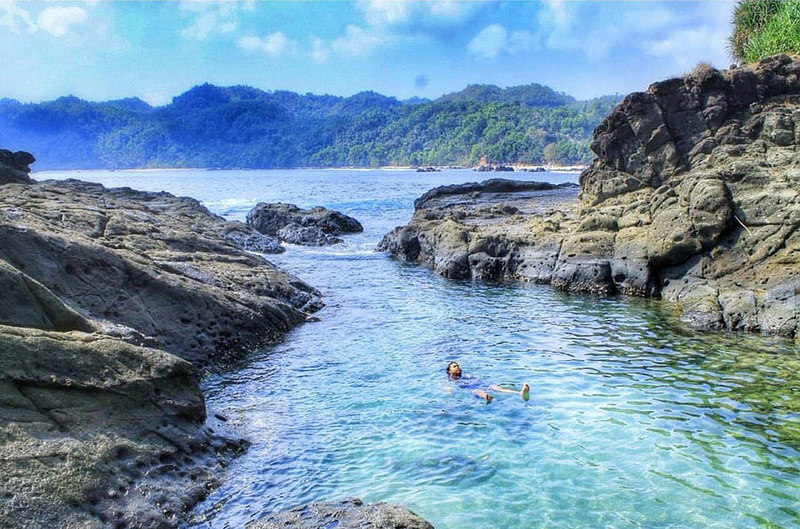 Ngrawah Beach is playfully hidden behind local farms, but with such beauty, we bet it will be hard to conceal it from the public eye. 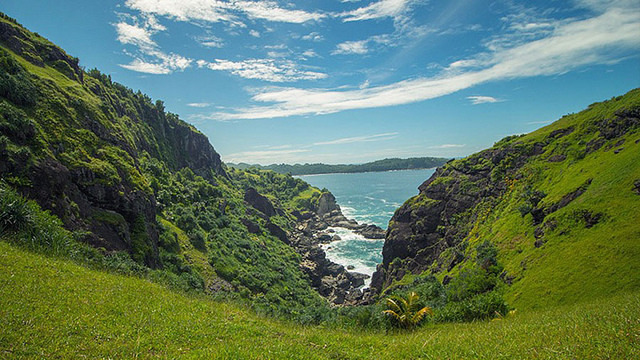 A vast stretch of white sand sandwiched between two vigorous cliffs is what Ngrawah beach has on offer. Come here during dusk and be hypnotized by marvellous sunset views as hues of orange and pink take over the sky! After sunset, settle in for Mother Nature’s best show! Kick back and relax as a dazzling Milky Way comes on stage to sparkle the sky. The scene and ambience make it the perfect date night with your loved one. Stay over for the night and enjoy camping under the stars while you both share your wildest dreams. 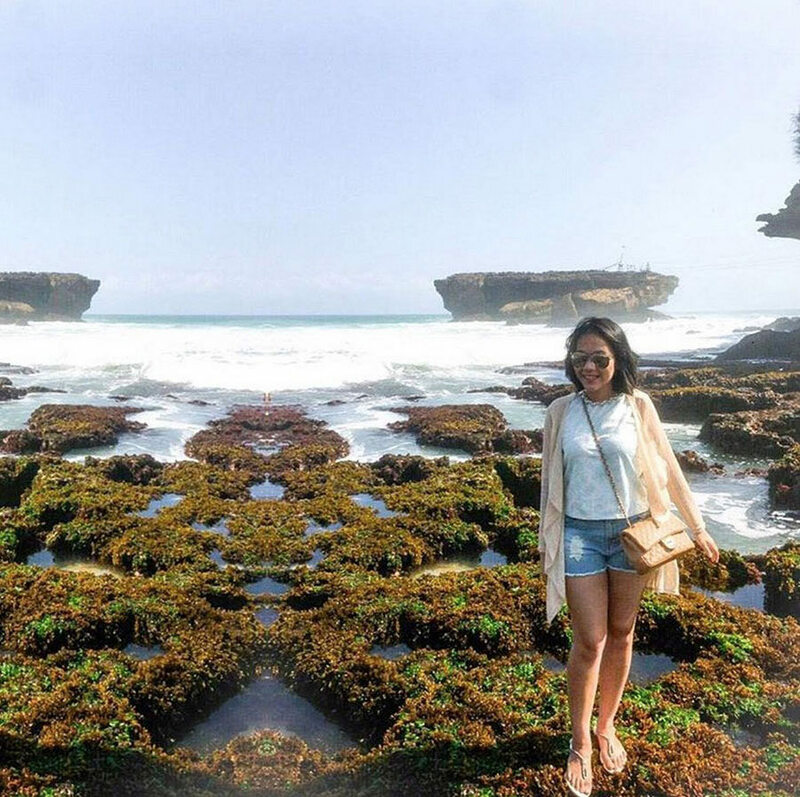 Checkout from reality for a short while and indulge in the beauty of Srakung Beach. This secluded paradise is the absolute best if you want to escape from the concrete jungle and get in touch with nature! 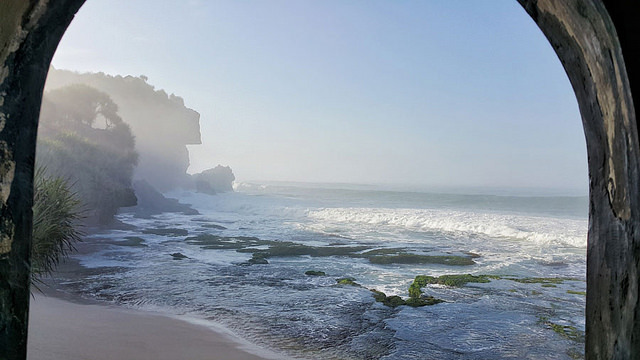 Flanked by two mighty cliffs, Srakung Beach resembles a white little carpet that stretches towards the horizon. And with unruly lush greenery spreading along the beach, you can feel a touch of wilderness too. Enjoy the moment and laze on the powdery sand as only a handful of people can be seen walking around the beach; it is still unknown to many so make the most out of it before the crowd learns about this place! After basking in the sun and enjoying the refreshing sea breeze, why not jump into the sea? After all, that’s what you’re here for! And if you are looking for other unique photo opportunities, explore the spot below the cliff as the oddly-shaped limestones make for quirky picture backdrops. 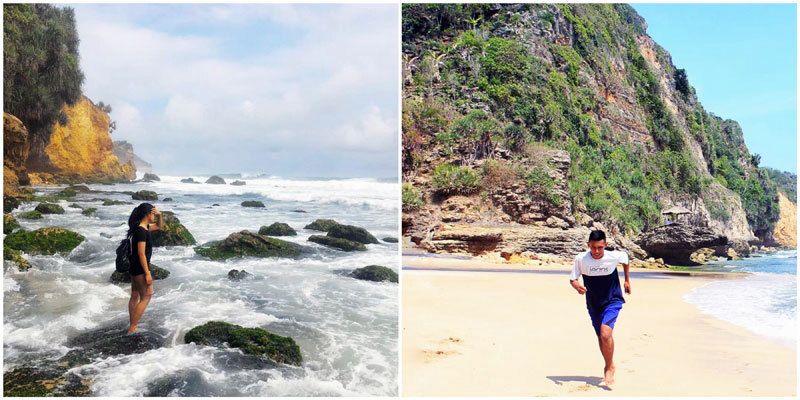 A long, narrow stretch of perfect sunburnt sand outlined by fifty shades of blue make Nampu Beach an irresistible spot for nature lovers and beach bums alike. This exotic treasure is where people can enjoy the traditional sea, sand, sun vacation with relatively calm and azure waters. After enjoying a refreshing dip, head to the various food stalls and enjoy a post-swim feast! 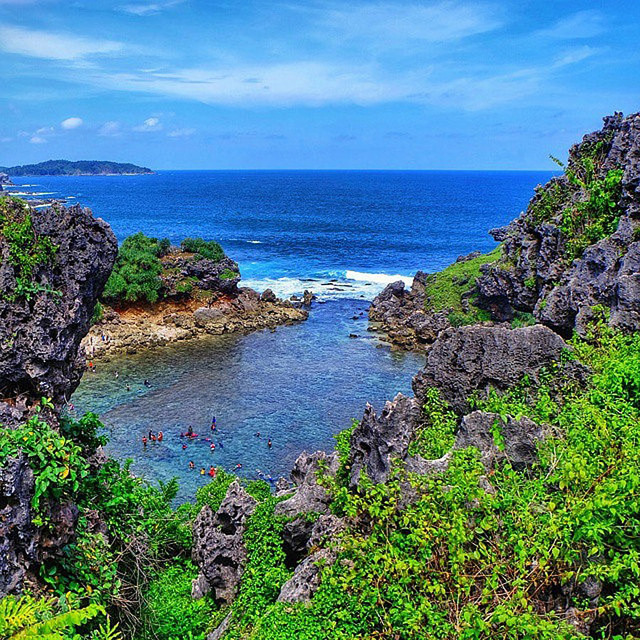 And just like other beaches along the Gunung Kidul shoreline, Nampu Beach is protected by a group of glorious karsts. The combination of the green hills along with its azure water views is the perfect cure for those in lack of some vitamin sea! 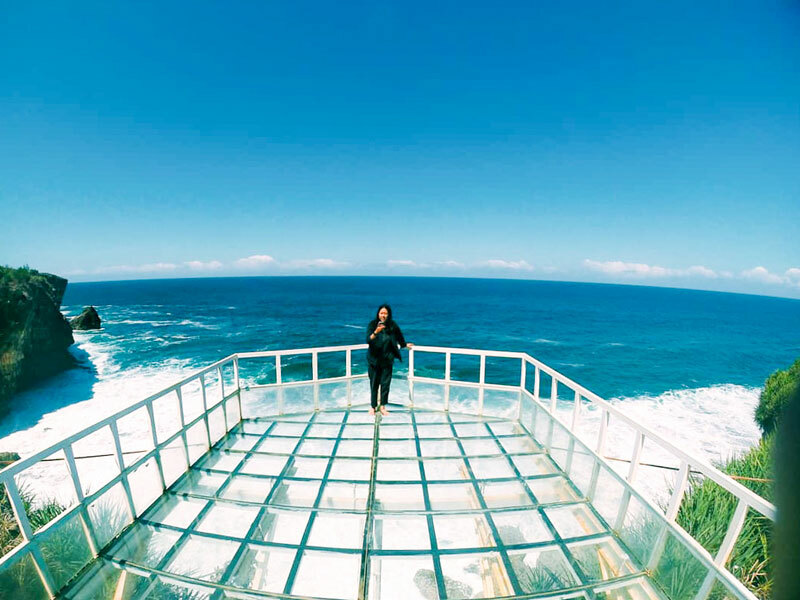 Not far from the beach, you’ll also find an Insta-worthy photo spot that resembles a ship perched on top of a hill. Now onto your very own version of Titanic with glorious sea views! Parking fee: Rp. 2,000 for motorcycle (Approximately USD $0.14) and Rp. 5,000 for cars (Approximately USD $0.34). 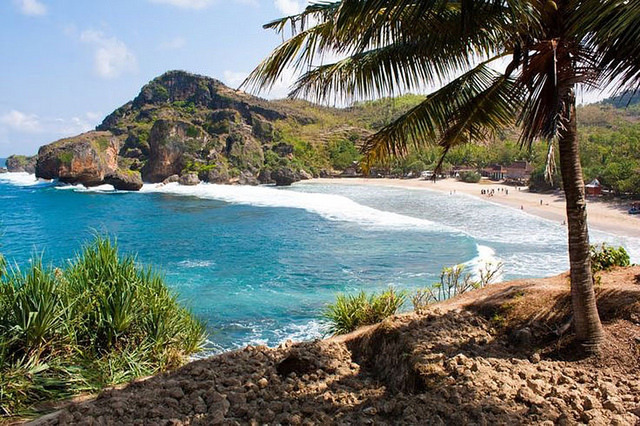 Seruni Beach is a bit of a secret. 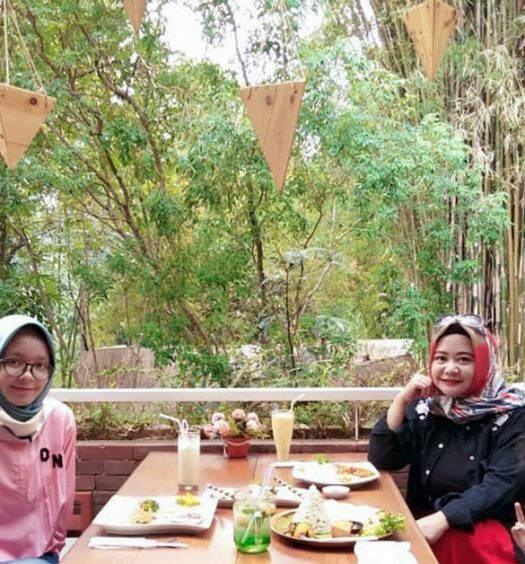 Sure, it comes with hardly any facilities, but it is a place where you can still appreciate Yogyakarta’s natural beauty in peace and quiet with maximum privacy. Aside from its powdery white sand and turquoise water, the unique cliff stone formations make for an exotic backdrop for photos. But don’t forget to feast your eyes before your phone does! 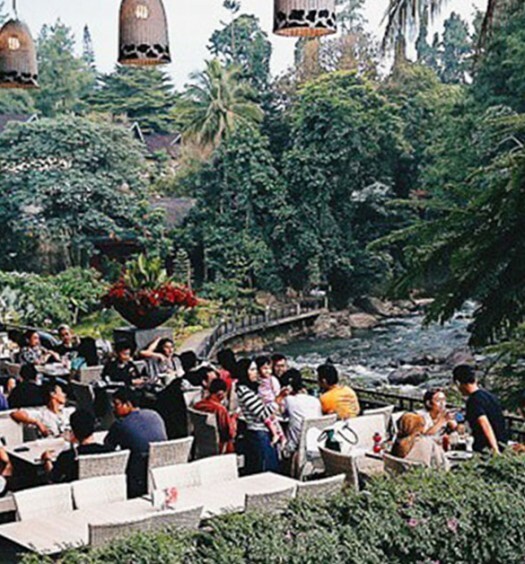 Personally, we think the spot would be perfect for an exciting beach club, similar to Sundays Beach Club in Bali. Tucked away but also totally ‘grammable, you sure don’t have to worry about anyone else getting into your shot (unless they’re reading this article). 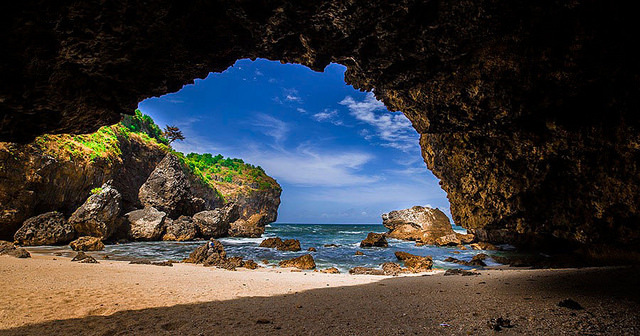 Seruni Beach also doubles as one that hides a secret cave. And besides being ridiculously beautiful, it provides fresh water that can be used for cooking and drinking when you’re here on a camping mission. 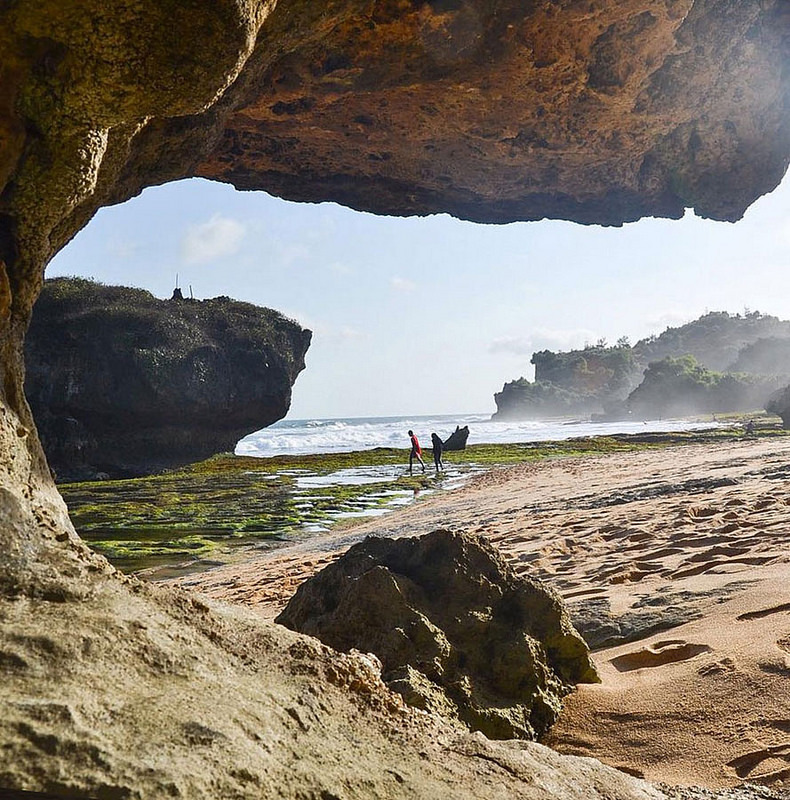 Located in Panggang, one of Gunungkidul’s more untouched sub-districts towards the east, is a rarity only seen on this stretch of the sand. The Wohkudu Beach is certainly a must-visit for those looking for solitude. It’s so quiet – we wonder if it’s because of its inaccessibility or the lack of information available. Reserved for those who don’t mind getting through a bit of trouble, trade asphalt roads with rocky trails as you enter the Pangggang Sub-District, with nothing but trees on both sides of the road. The trail gets narrower, to a point where it becomes impossible to go any further. Find a safe place to park your vehicle and you’ll find your well-earned prize in a few minutes’ walk. 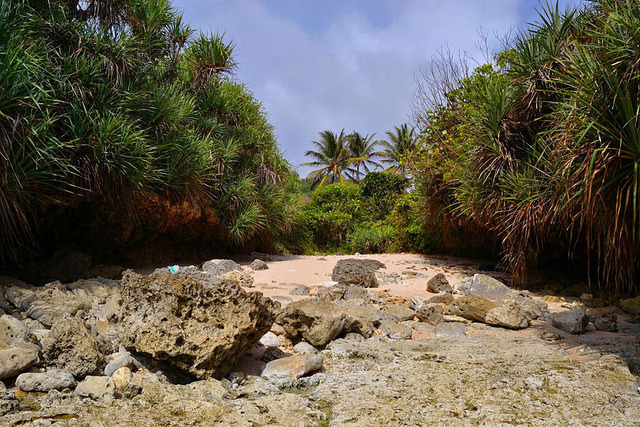 The Wohkudu Beach is tucked away between two hills that act as barricades to give it that secluded feel. If you can’t find the footpath from the parking area, simply walk between the two hills that’s visible from the area into the mildly dense forest and you will reap your reward. Besides being stunning to look at, the concave rock formations also provide shelter for visitors. 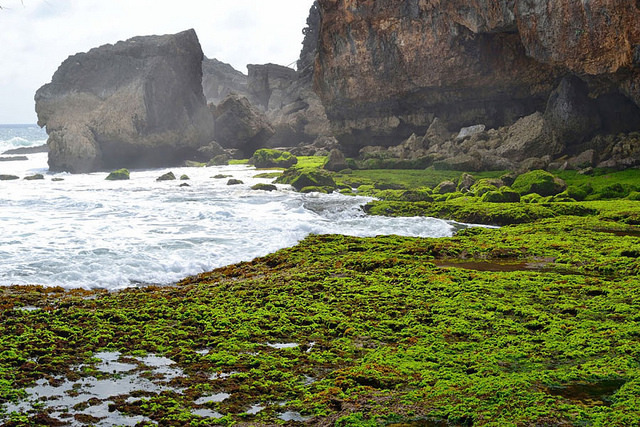 The beach itself is not that wide – half of it is covered by coral rocks lined with moss and shrubs. Of course, that wouldn’t be a problem if what you are looking for is some peace and tranquility. Getting There: From Yogyakarta City, head South passing Imogiri. Head in the direction of Pantai Kesirat. Take the small road to the left just before reaching Pantai Kesirat. Go as far as you can and find a safe place to park your vehicle. Coordinates here. 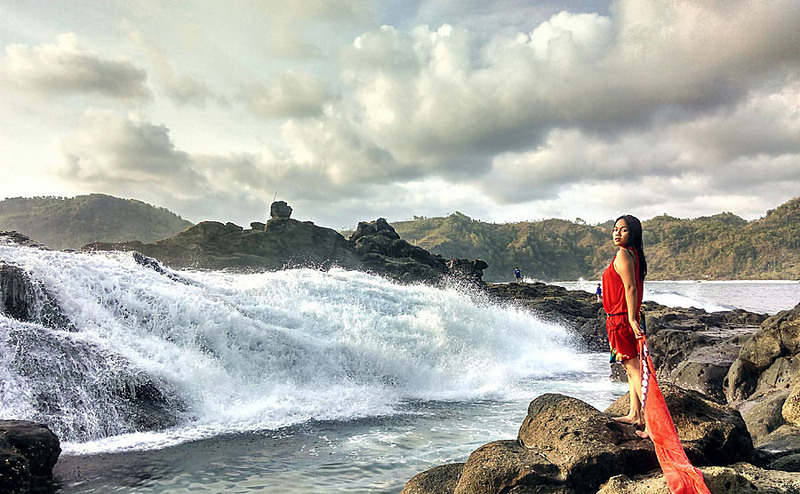 Hidden behind the Sewu Mountain Range lies a rarity that’s hardly seen elsewhere in Indonesia – a waterfall by the beach that falls directly into the sea. 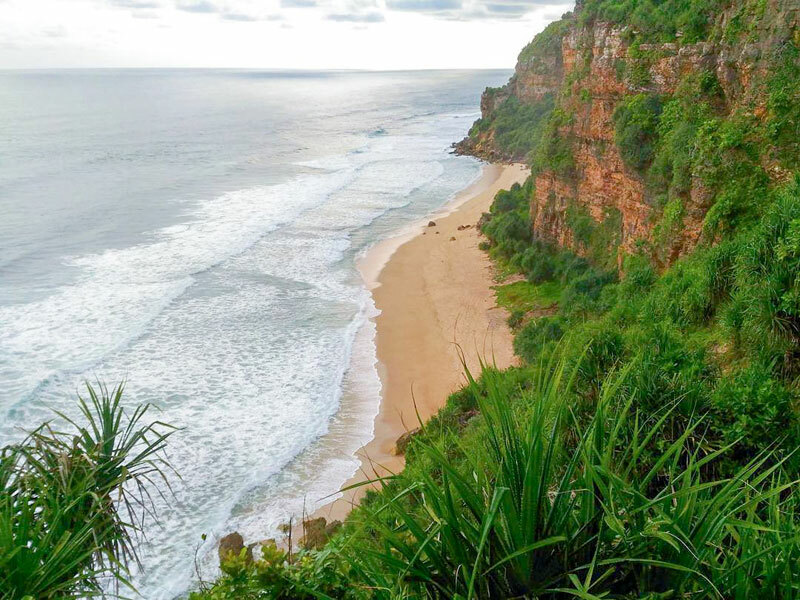 Known as Jogan Beach, it sits humbly on the south coast of the Gunungkidul region of Yogyakarta, facing the vast Indian Ocean. 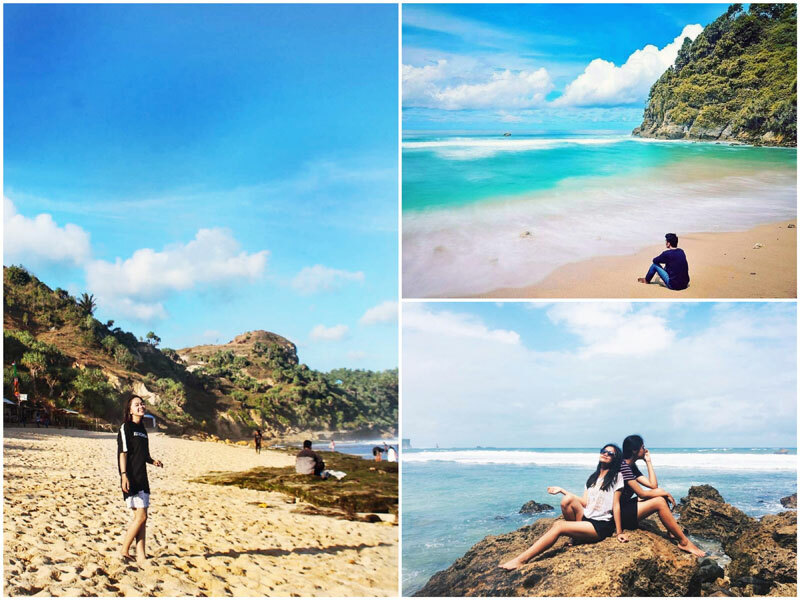 Located two hours’ drive away from Yogyakarta city, Jogan Beach is often overlooked by most visitors as it requires an additional several hundred metres’ walk from the more commonly known Siung Beach parking area. Perfect for those looking for a bit of privacy. 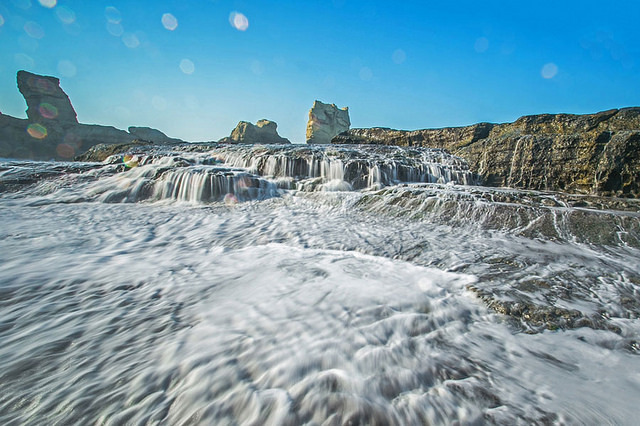 The waterfall flowing into the sea is not just an astonishing sight. Visitors brave enough can enjoy a freshwater shower beneath the waterfall by either rappelling or climbing down the rocks. 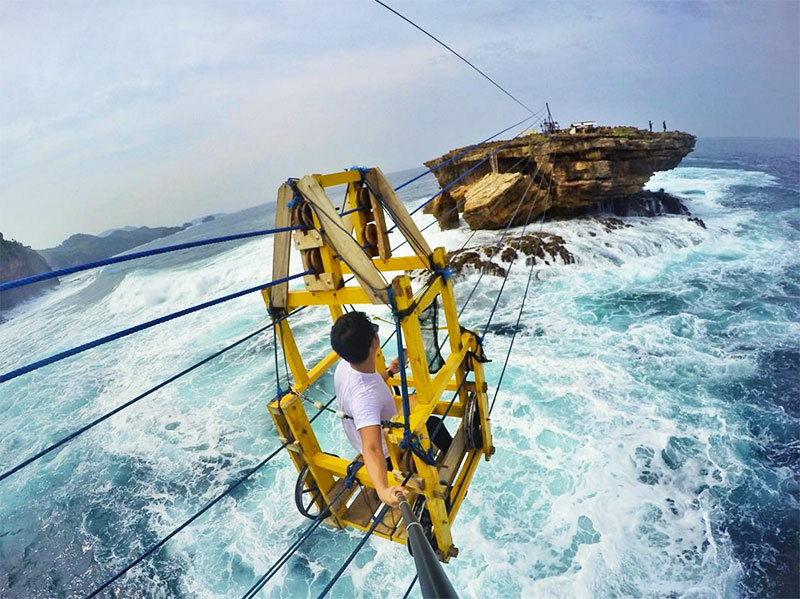 But be careful – although the rocks have been installed with wooden hand-and-foot grips, they may still be slippery, especially during the rainy season. The obstacles don’t just end there – past the jagged coral rocks is the habitat of thousands of tiny crabs that won’t hesitate to snip at your feet! They may be only a painless pinch at first, but a few dozen might just become a nuisance. Are you still up for the challenge? Getting There: From Yogyakarta City, head East towards Wonosari. turn right Southwards onto Jl. Kasatrian towards Pantai Siung, a well known recreational beach. 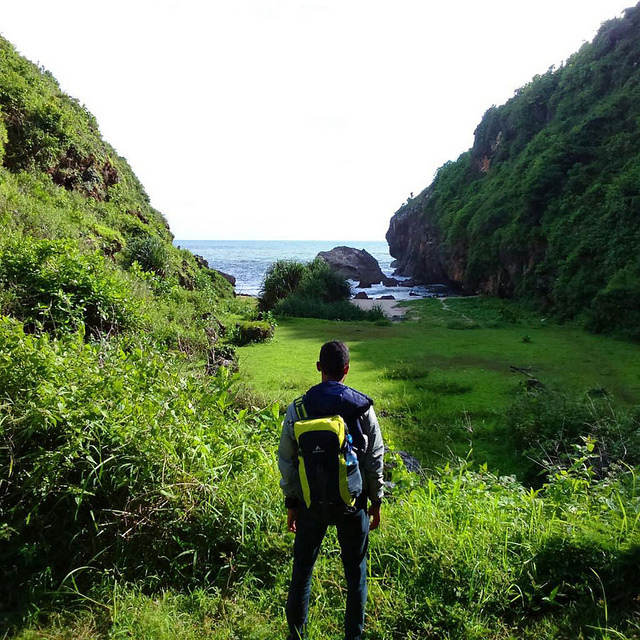 Your destination is a 400m walk from Siung Beach. Coordinates here. There is simply nothing better than sitting by the shore, enjoying the sunset, and appreciating the view from above with a calming breeze to puff your worries away. 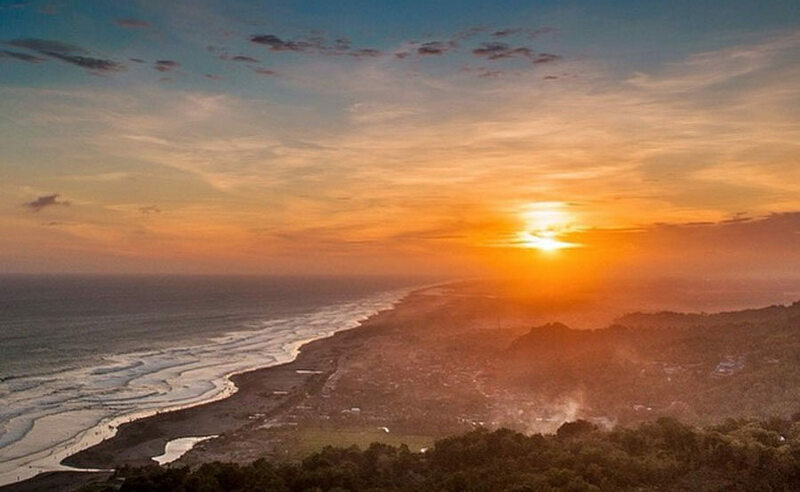 Situated near Yogyakarta’s most popular beach, the Parangtritis Beach, the Parangndog and Paralayang Hills provides a vantage point where visitors can admire the hills meeting the fringe of the coast and the sea that stretches towards the endless horizon. Westward facing, it’s a great spot to watch the sun go down. What’s even more fascinating is that the hills are used as training grounds by local paragliders. 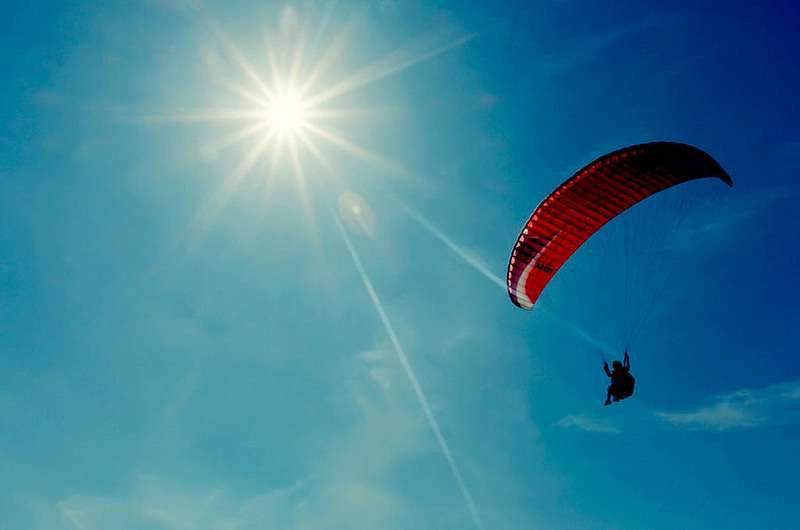 Although you will need a license to fly on your own, tandem flights are just as thrilling! Make sure you make a booking beforehand as their availability highly depends on wind conditions. Location: Parangtritis, Kretek, Bantul Regency, Special Region of Yogyakarta. Coordinates here. 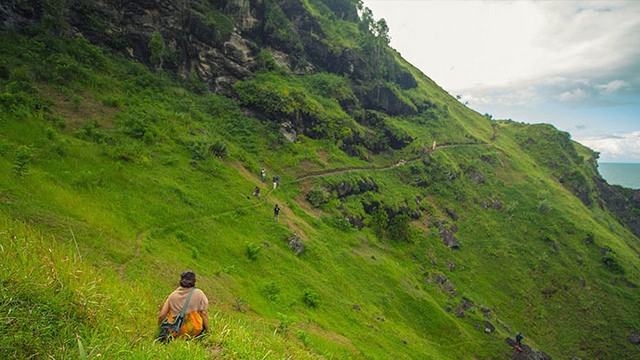 Getting There: Upon reaching Parangtritis beach, head to the hilly region westwards. Make a right turn Queen of the South Resort and your destination will be nearby. Make sure your vehicle is in optimum condition as the roads are quite rough. 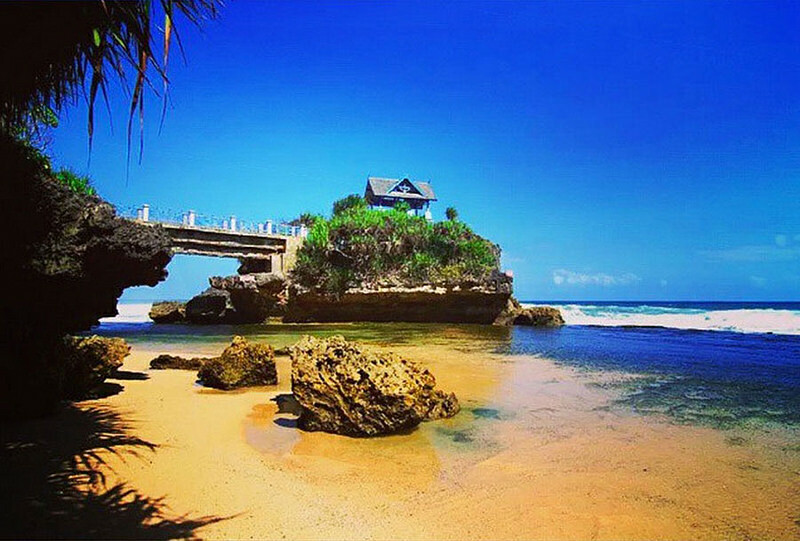 With white sands stretching far and wide, Kukup Beach is one of the most popular beaches in the Gunungkidul region. What makes it so special is the formation of coral rocks that stretches about 100 metres into the sea. 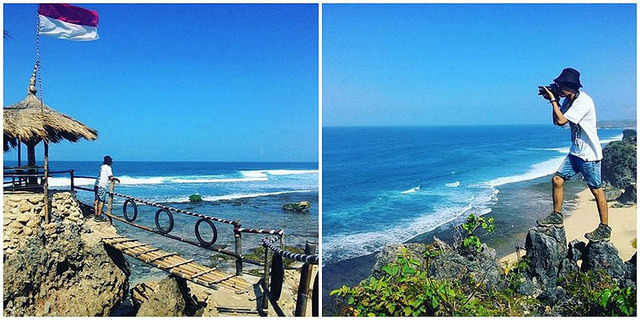 Besides serving as a natural stairway into the sea, it provides a breakwater to calm the waves. Let starfish and many more tiny sea creatures tickle your toes as they add a contrast of colours with the brown stones and blue water. The coral stones protect them against the violent currents of the ocean. Do watch out for sea urchins though – their stings aren’t the most pleasant in the world! 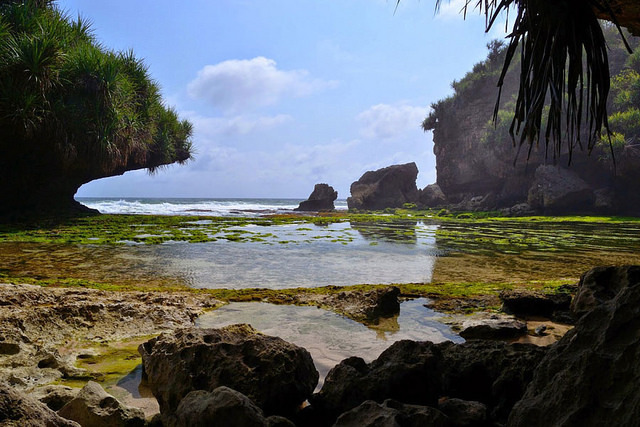 Just like Tanah Lot, a tower of coral rocks forms a small island called the Jumino Island right at the edge Kukup Beach. 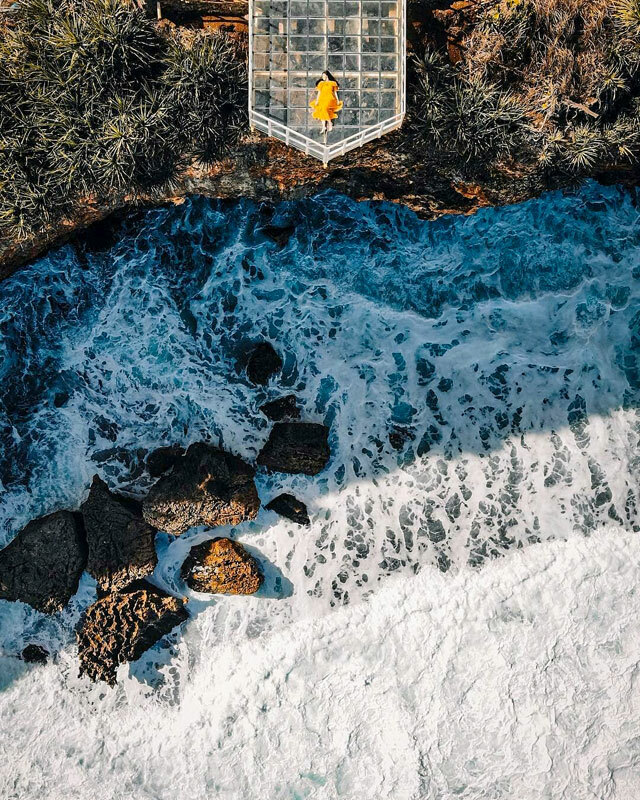 Visitors can cross over a few dozen metres via a bridge to the island to take a closer look, but unlike the temple at Tanah Lot, the authorities at Jumino Island have built a resting shelter at the end of its pathway. Getting There: From Yogyakarta, head towards Wonosari. 40 km before Wonosari, turn right towards Pantai Kukup Baron. Coordinates here. 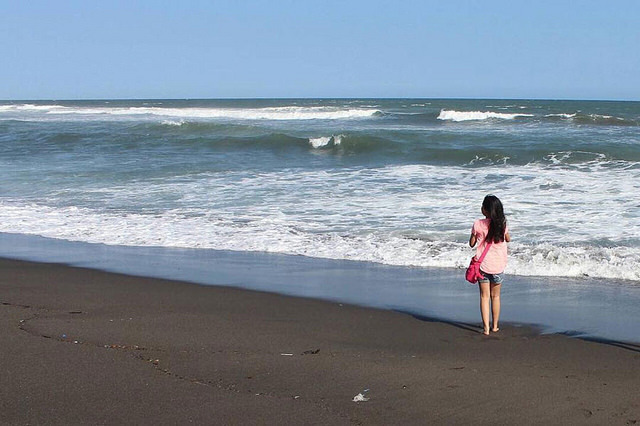 Facing southwards, most beaches in Yogyakarta often face the Indian Ocean. These conditions do not support snorkeling and the formation of coral reefs. The Nglambor Beach is an exception – an accumulation of rocks off the bay in the shape of two turtles act as shields from waves. Combined with shallow waters and lots of sunlight, the conditions become just right for a coral reef to form, which in turn attracts lots of colourful fish. 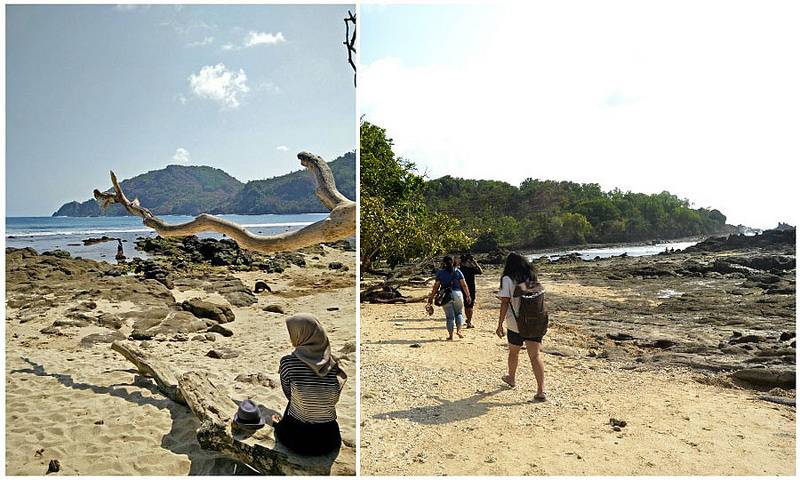 Hidden between Siung Beach and Jogan Beach, there’s no access roads to get to the Nglambor Beach. Visitors on four wheels must park at a designated area and walk several hundred metres. But this inaccessibility keeps the beach more private and exclusive to adventure seekers. You can wade among the starfish and other residents of the coral reef, or get up close and personal with the underwater wildlife and rent some snorkeling gear! Getting There: From Yogyakarta City, head East towards Wonosari. turn right southwards onto Jl. Kasatrian towards Pantai Siung, a well known recreational beach. After the post at Pantai Siung, turn right at the junction and look for the parking lot to Nglambor Beach. Follow its footpath and you will get to your destination. Coordinates here. 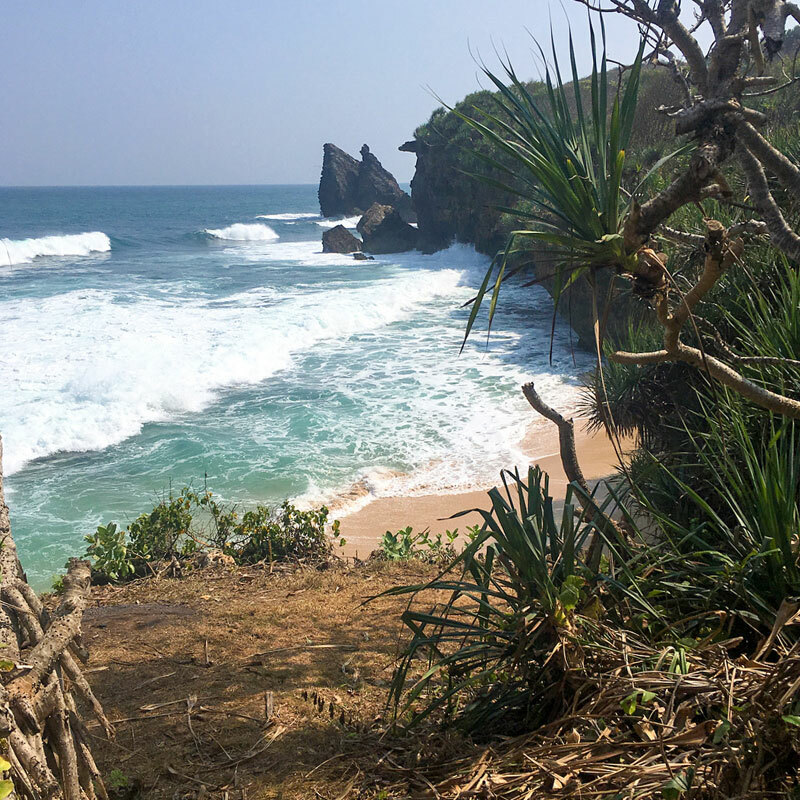 Nestled between the more well-known Pantai Indrayanti and Pantai Pok Tunggal, it’s puzzling why the Pantai Watu Lawang is not as popular as its neighbors. The beach is split into two by a rocky cave, which offers a great panorama if you manage to find your way to the top of the rocks. 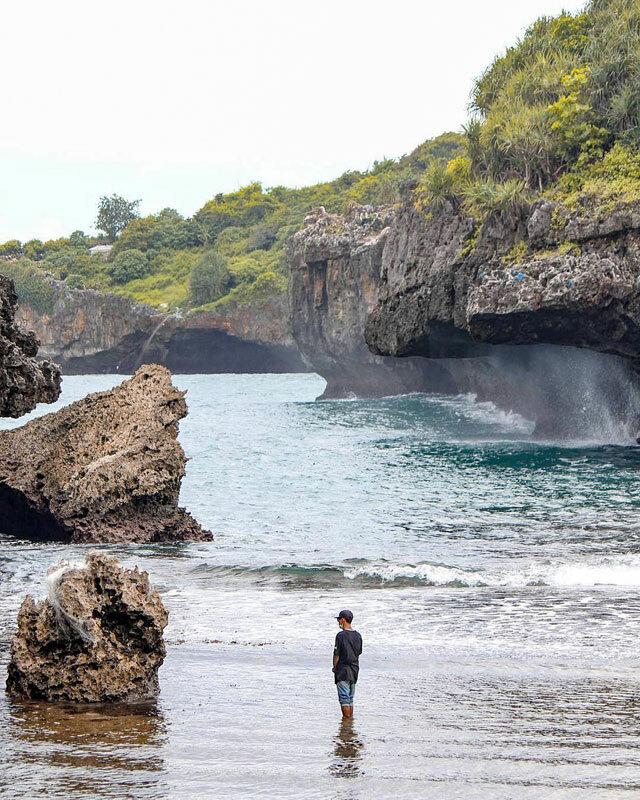 Watu Lawang itself means ‘Stone Door’, which might have been derived from a rock that looks like a door at the cave’s entrance. Consisting of two sides separated by the ‘stone gate’, the west half of the beach is smaller and more private, while the other side is exposed to a wider part of the sea. While strolling along its coral bay, you will notice that there are small pods sculpted naturally in just the right shape to curl in and take in the euphoria of the pulling and pushing off the crashing waves. 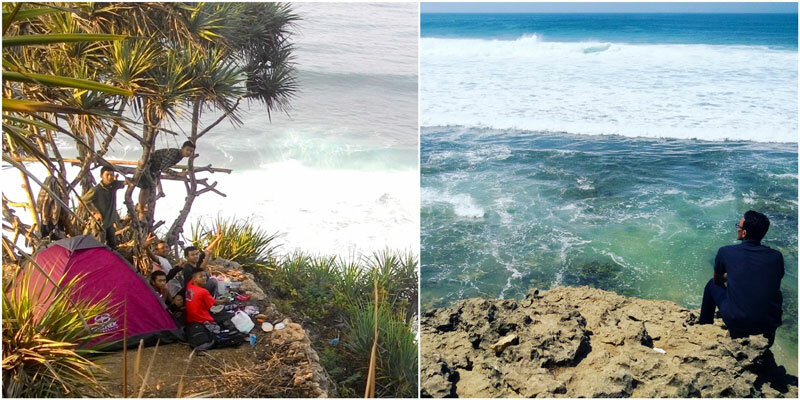 The Watu Lawang beach is considered sacred by its locals. Once a year, on the eighth month on the Lunar Calendar (Sya’ban in the Islamic Calendar, or somewhere around the Mooncake Festival month), a religious ritual called ‘Nyadran’ is held on the beach. A part of the ceremony involves all the participants entering a small cave in the centre of the beach. What’s fascinating is that the locals believe the cave ‘opens up’ to accommodate the people entering. Believe it or not, prove it for yourself! Getting There: From Yogyakarta, head towards Wonosari. 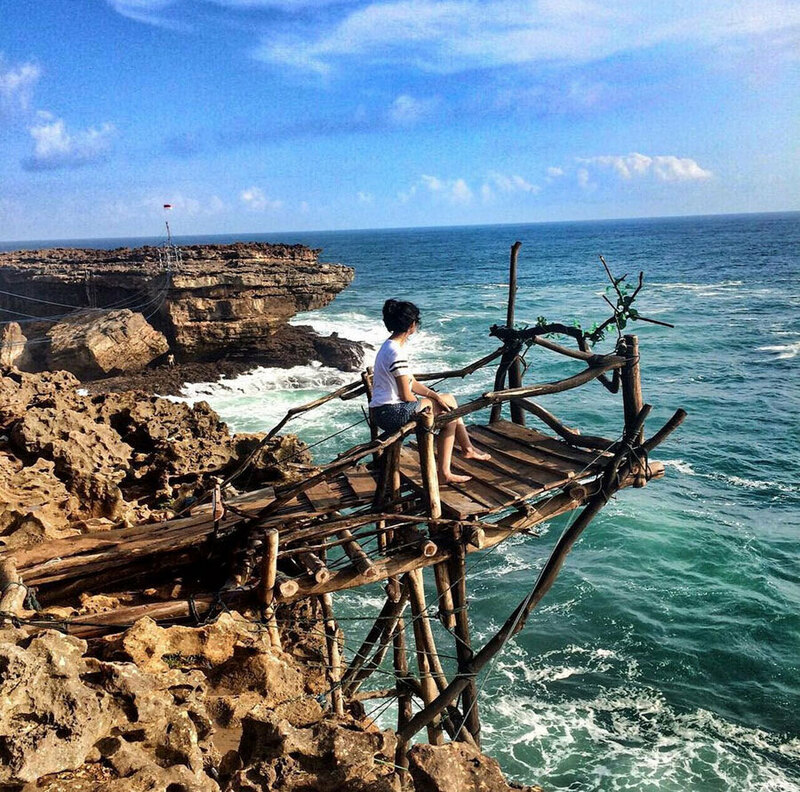 Once there you will find directions to Pantai Indrayanti, your destination is further down the road. Coordinates here. 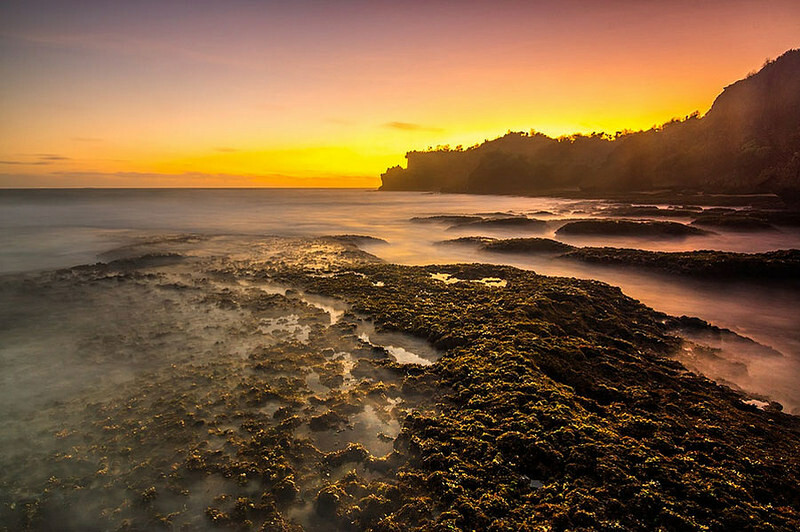 Although the Pantai Ngrenehan is a small beach, its uniqueness lies in the formation of rocks that extend on both sides of the beach. Not just beautiful to look at, these rocks also act as breakwaters that shield the beach from violent waves. 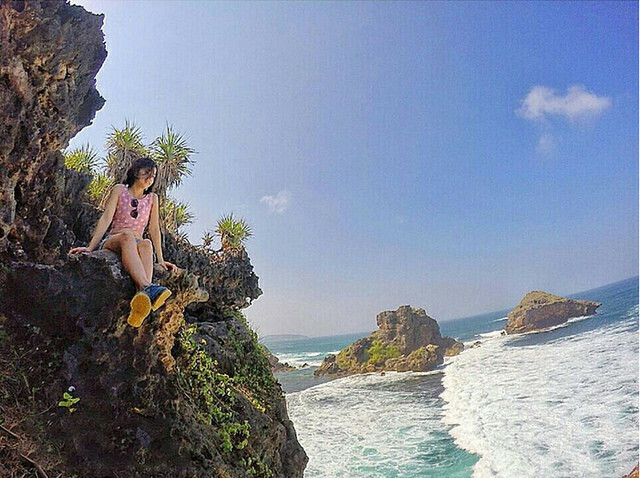 Make your way up these rocky hills and find yourself at the best spot to adore the view. Observe the simple lives of the village fishermen, their daily activities beginning with setting out to sea in the morning, to sorting out their catch of the day. Every seafood lover knows that the fresher the fish, the better the taste. Their catch is brought directly to the nearby markets. Auction for the fish of your choice to bring home, or hand them over to waroeng keepers – they might be able to grill and prepare it for you with Liwet Rice for a negotiable price. A serving of fresh lobster in creamy oyster sauce costs as low as 50,000 IDR (3.50 USD), and if that still hasn’t satisfied your inner fisherman, the locals offer morning fishing trips for visitors on traditional fishing boats. 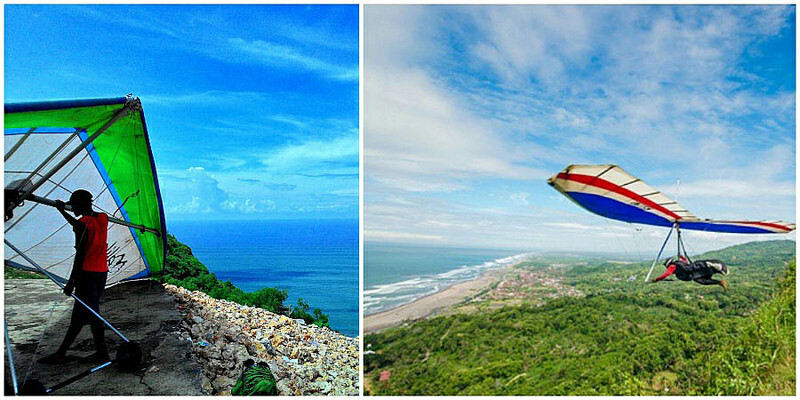 Getting There: From Yogyakarta City, head towards Gading, and then Playen, Trowono and you will find Pantai Ngrenehan. Coordinates here. As one of the most secluded spots on our list so far (it isn’t even on google maps! 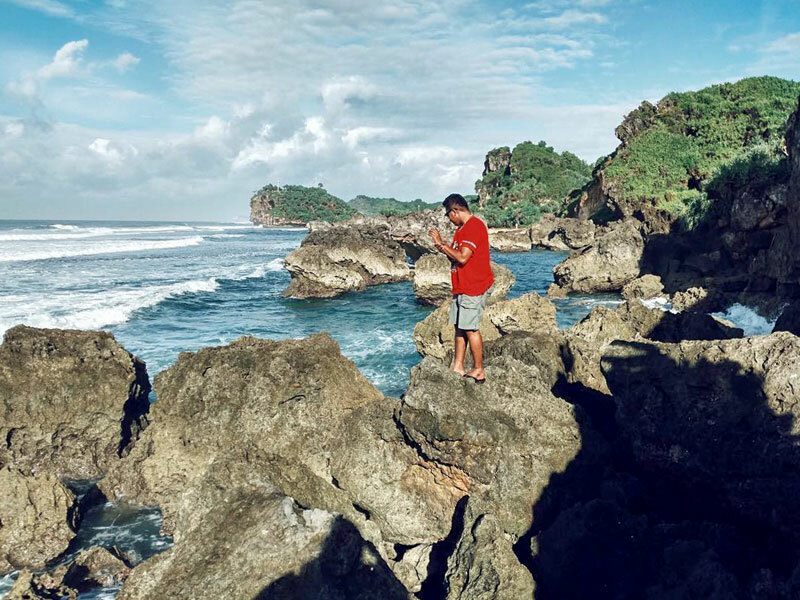 ), the only visitors to Pantai Dadap Ayam are the local residents in search of beach vegetation such as the Dadap Ayam herb and seaweed that grow on its concave-shaped rocks. 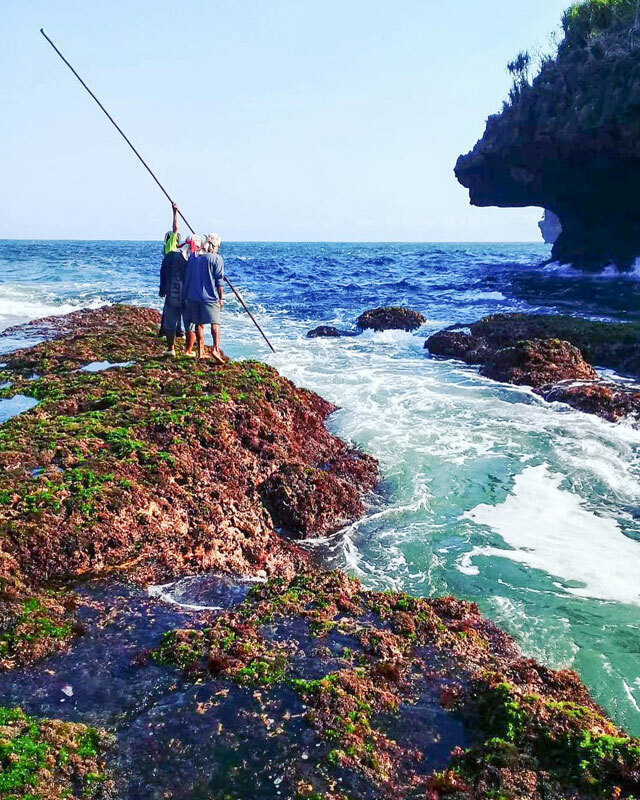 Resembling Padang Padang Beach in Bali, the Pantai Dadap Ayam is a gallery of odd-looking coral stones with overgrown algae and seaweed. Make sure to take extra caution as they might be either sharp or slippery. If you don’t like the sun, you’ll love the shade under the rock canopies that line the beach. Bring a mat and enjoy a picnic on this secret patch of the beach – it’s so quiet that the calming winds will definitely seduce you to an afternoon nap. Hurry though, a paved road heading towards the Pantai Dadap Ayam is currently being constructed. So although this means you won’t scramble through several bushes and paddy fields, many others may think the same way too. It might not be as ‘private’ anymore! Getting There: From Yogyakarta, head towards Wonosari, and then drive in the direction of Paliyan, Trowono and you will reach Pantai Ngobaran. 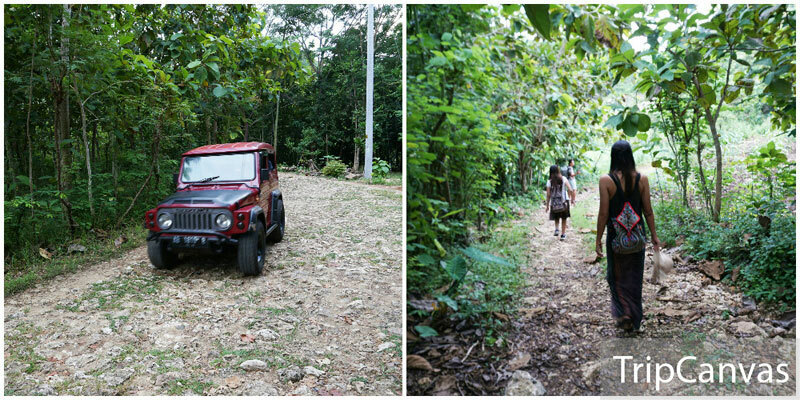 Park your vehicle at Pantai Ngobaran’s parking lot and follow the pathway towards Pantai Dadap Ayam on foot. Coordinates here. 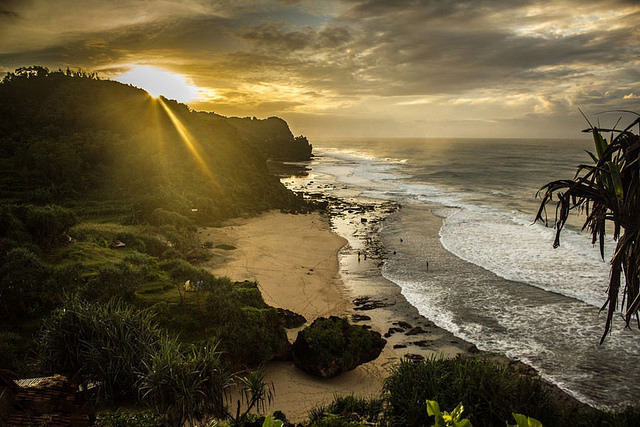 In terms of landscape, the Ngobaran Beach ranks among some of the most amazing beaches in South Yogyakarta. 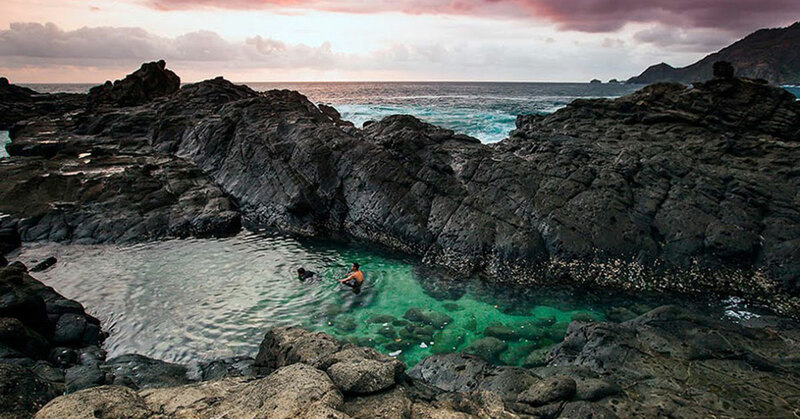 At low tide, moss-covered coral rocks emerge, exposing its collection of flora and fauna. If the tides are calm enough, you can take a dip in one of its ‘stone bath pods’ on the beach. The water inside these pods is actually freshwater, despite being right on the beach! 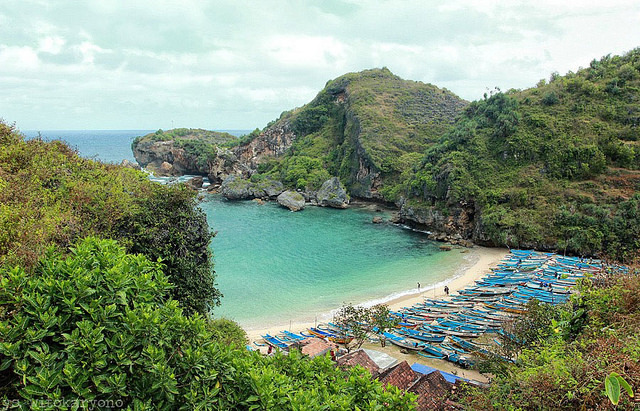 What you won’t find on any other beaches in Yogyakarta is the series of Hindu, Buddhist, as well as Kejawan temples that are perched on Ngobaran Beach. 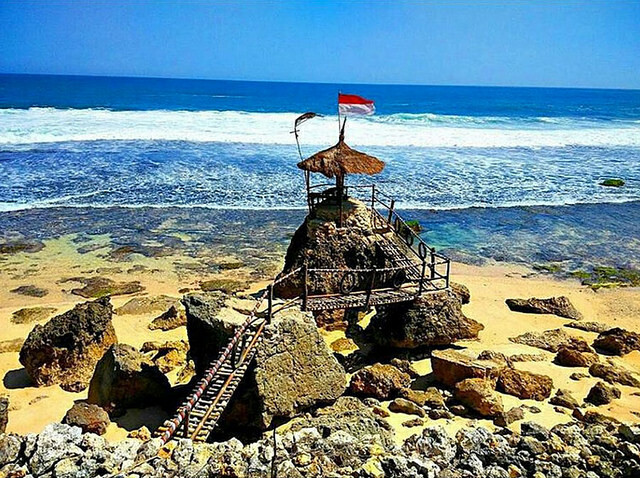 Believed to be the resting place of the legendary King of Majapahit, the beach is often used as a place of worship. A monument stands right at the edge of a cliff, with statues each depicting moral values of the Kejawan belief. The mosque in the vicinity also faces an open wall – in the direction of the sea with sandy floors. (Though it is commonly criticised because it faces southwards rather than westwards in the direction of Mecca). If you love food, one good reason to drop by this beach is the strange delicacy it serves (and you can hardly find it elsewhere!). Here, sea urchins are cracked open and fried with oils, herbs and spices. If you’re adventurous, give it a try – who knows, it could be the next culinary breakthrough! Location: Pantai Ngobaran, Jl. Ngobaran, Ngrenehan, Sapto Sari, Gunungkidul. Coordinates here. Heading to East Java? 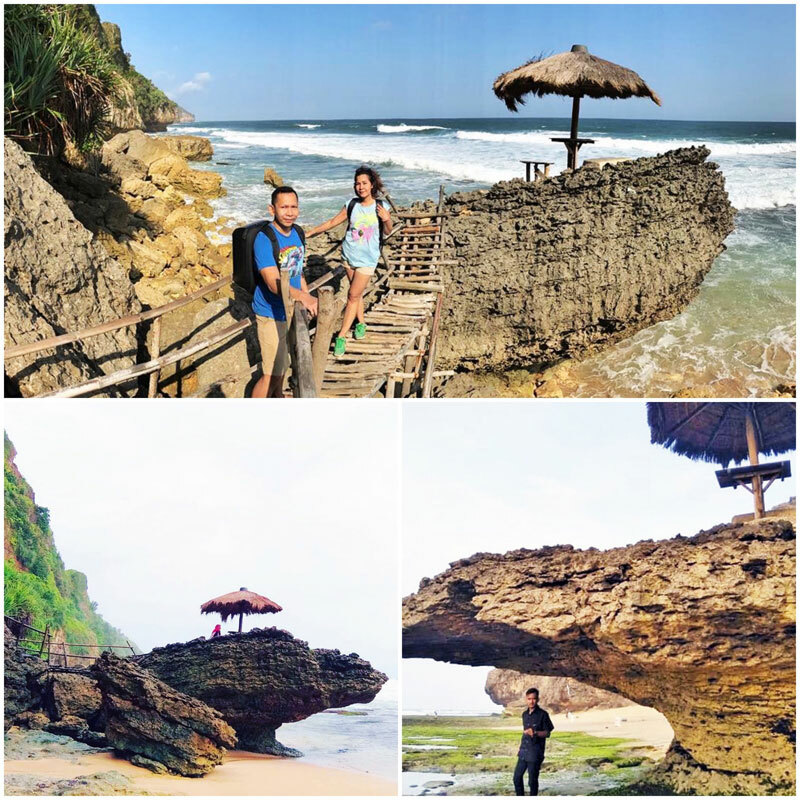 Why not make a pit stop at Klayar Beach for a showcase of gigantic coral rocks on another level of exoticism? 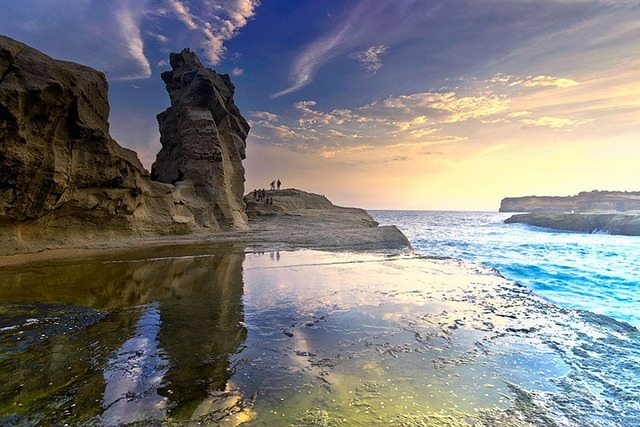 Rock formations beautifully sculpted by the waves reach heights of up to 50 metres on the Klayar Beach. 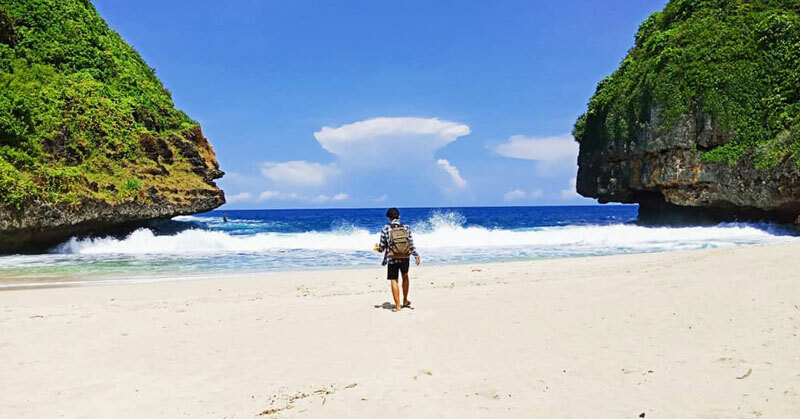 Another cool feature of the Klayar Beach is the Seruling Samudra, a water geyser (or otherwise also known as a waterblow) just behind the rock formations. Created by chambers being instantly pressurized by the waves, water shoots out 15 metres into the air during high tide. Just an hour away from Klayar Beach is the Goa Gong, claimed to be the most gorgeous cave in Indonesia. 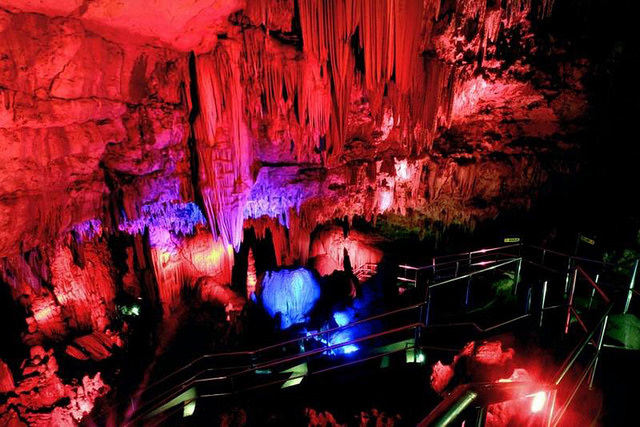 Exploring caves in the dark is thrilling, but doing so in an array of colourful illuminating lights is an entirely different experience. Getting There: From Yogyakarta, Head towards Wonosari on Jl.Wonosari/Nasional III, upon reaching Sendang, continue straight (Jl. Nasional III turns left). Follow the main road southwards and your destination will be at the end of the road. Coordinates here. 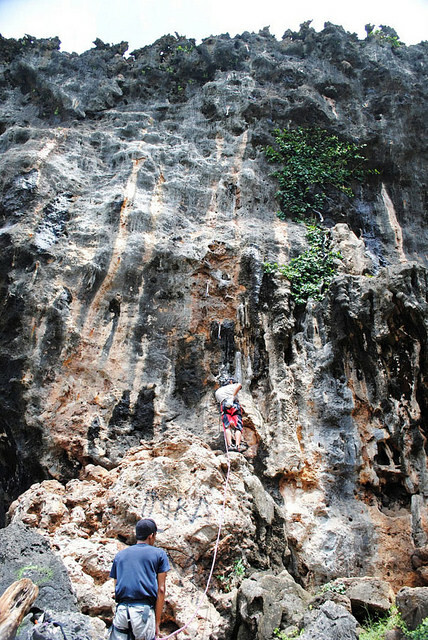 Popular for its stone cliffs, the Siung Beach has hosted multiple local and international rock-climbing events. 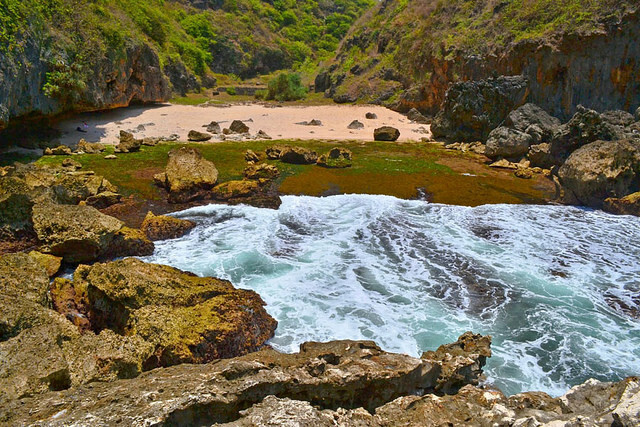 Hidden behind a forest trail, its attributes compare to the best beaches Yogyakarta has to offer. 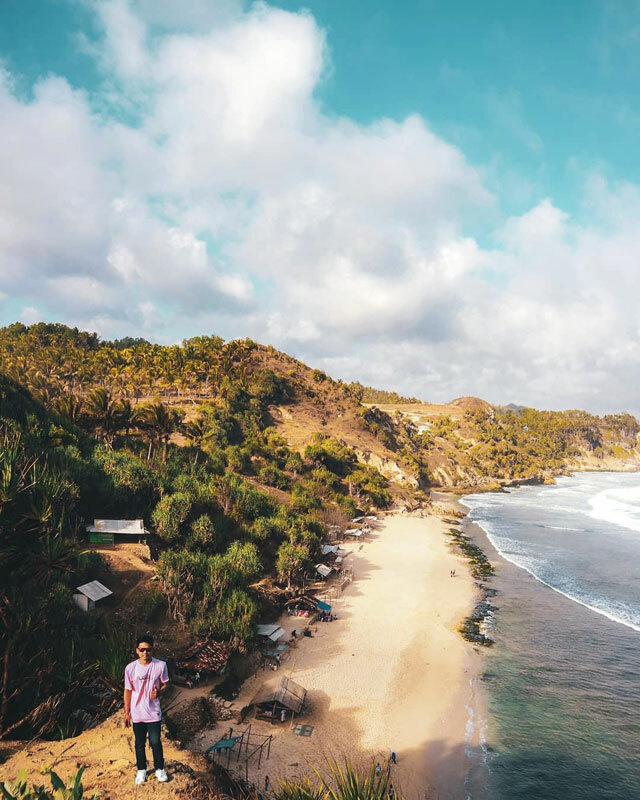 It also serves as a checkpoint for those whose intentions are purely beach-hopping – some of the most exotic beaches in Yogyakarta are within a walking distance from Siung Beach. Nglambor Beach is only a few hundred metres away! 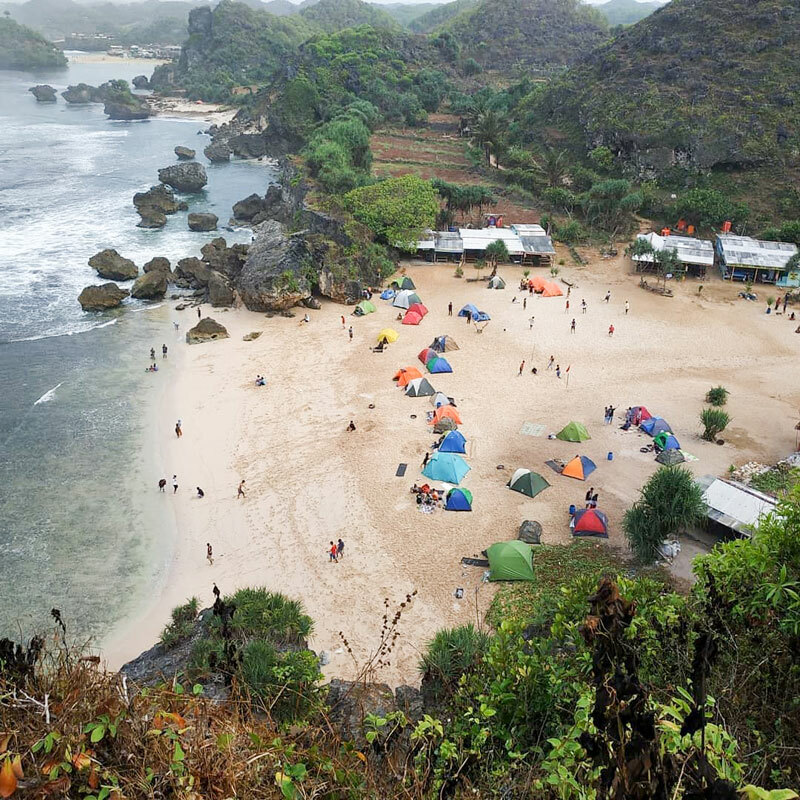 Because of the relatively wide beach, it is commonly used as a camping ground by beachgoers. Lay out your shelter for the night at around sunset – the beach keepers will offer firewood for a small amount of money. 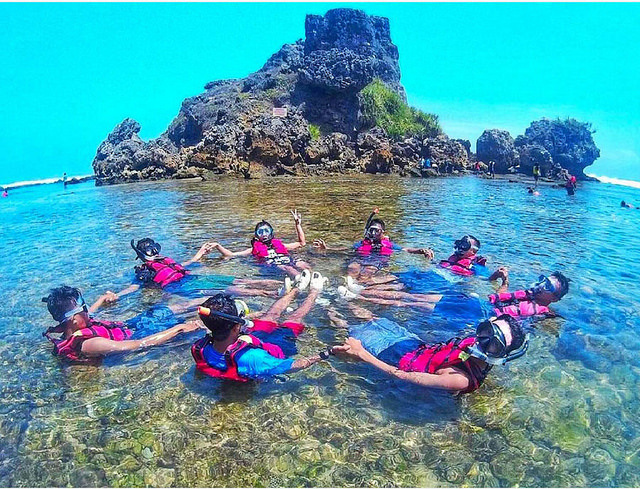 The next morning, you can prepare to make your way along the mountainous coastline, to get to Yogyakarta’s favourite beaches. 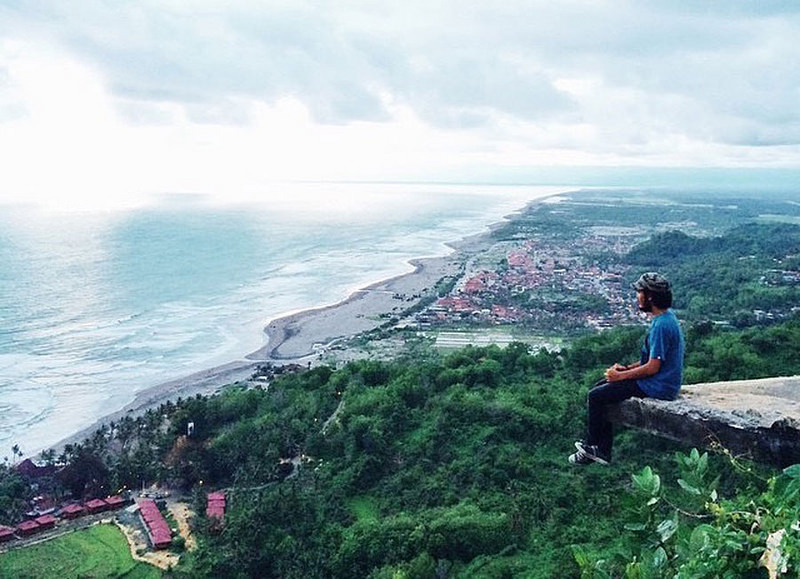 Location: Pantai Siung, Purwodadi, Tepus, Gunungkidul, Yogyakarta 55000. Coordinates here. Safety Note: Be mindful that most of these secluded beaches are not patrolled and don’t have surf life-saving services available. So if you’re planning to go for a swim, please be cautious and bring someone with you. 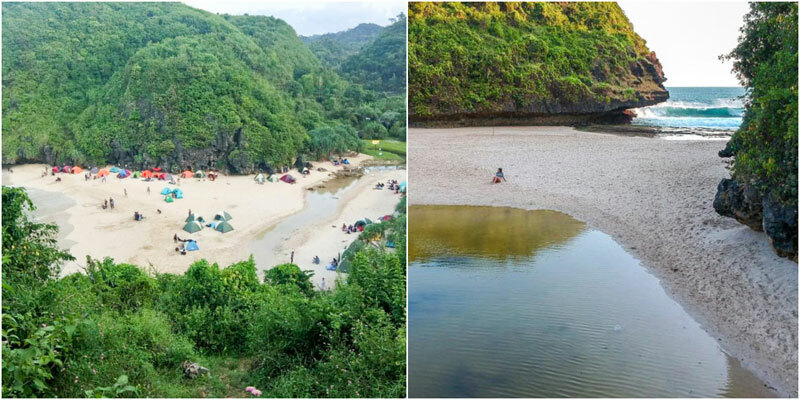 With these hidden beaches in Yogyakarta, you get to feel like you’re on your own private island! 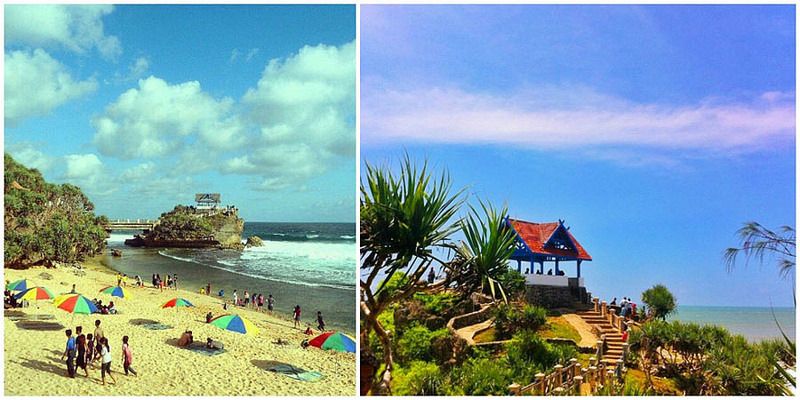 You now know where to go to escape the chaos of the big beaches of Bali. Who’s the beach goer you’re bringing along with you? Tag them in the comments’ section below!